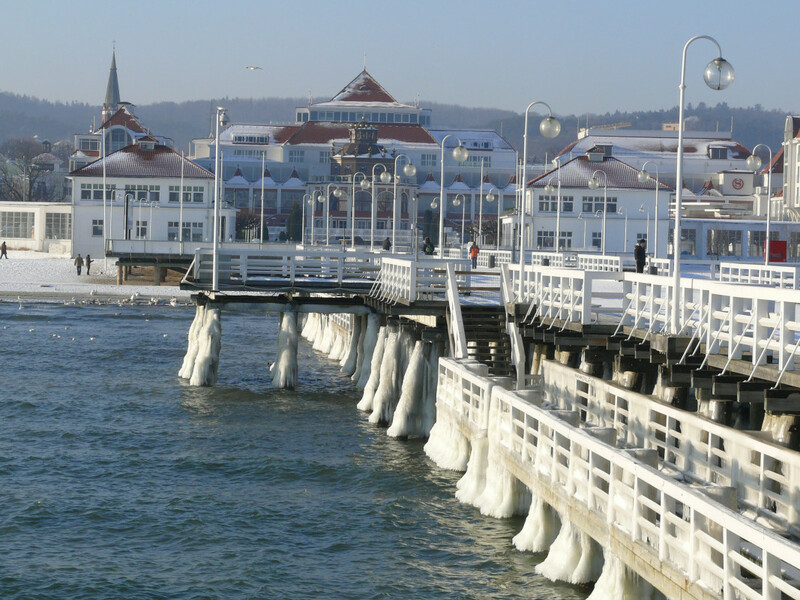 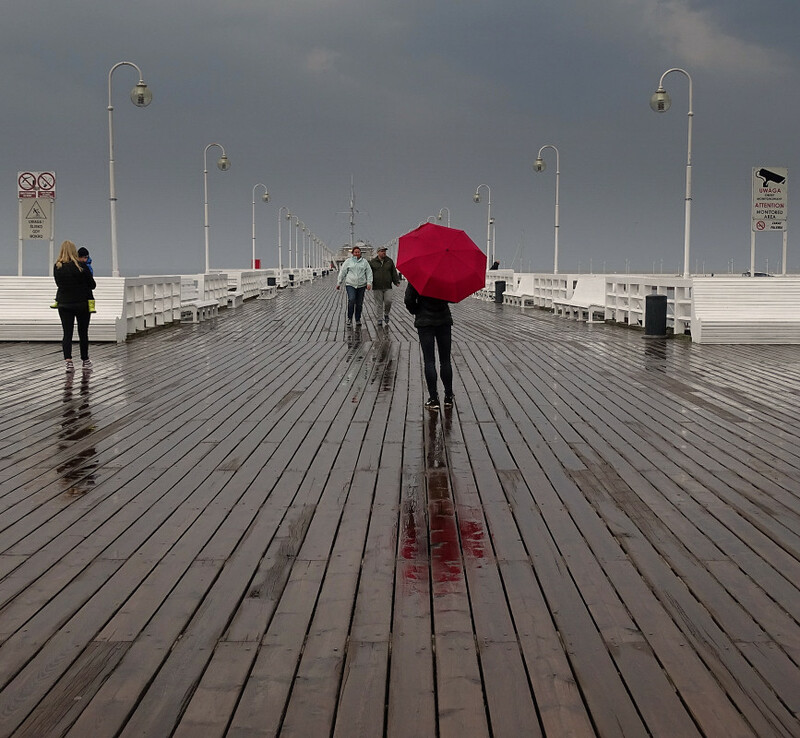 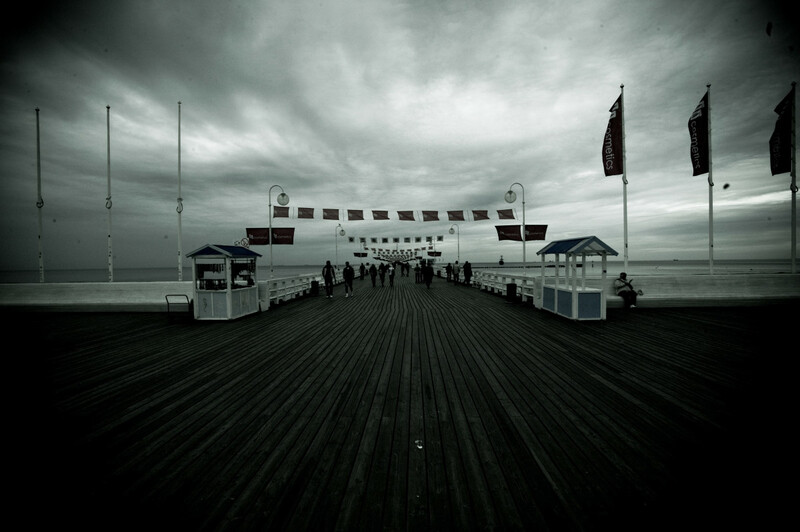 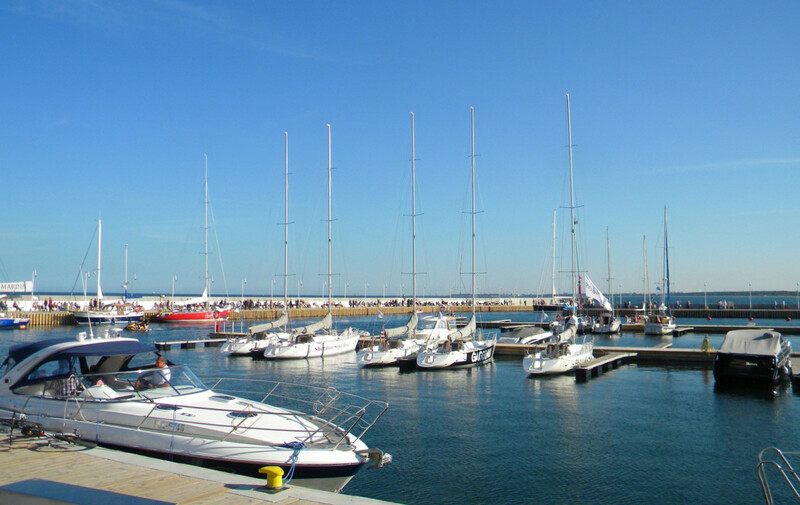 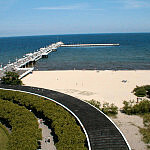 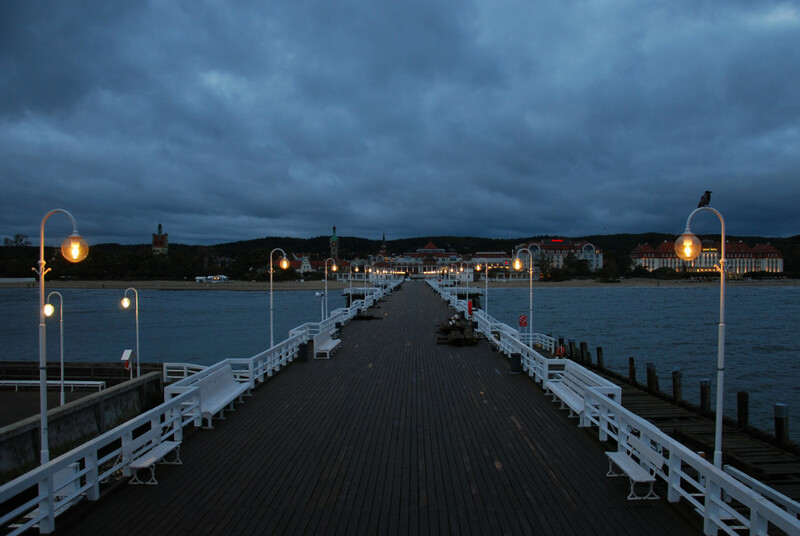 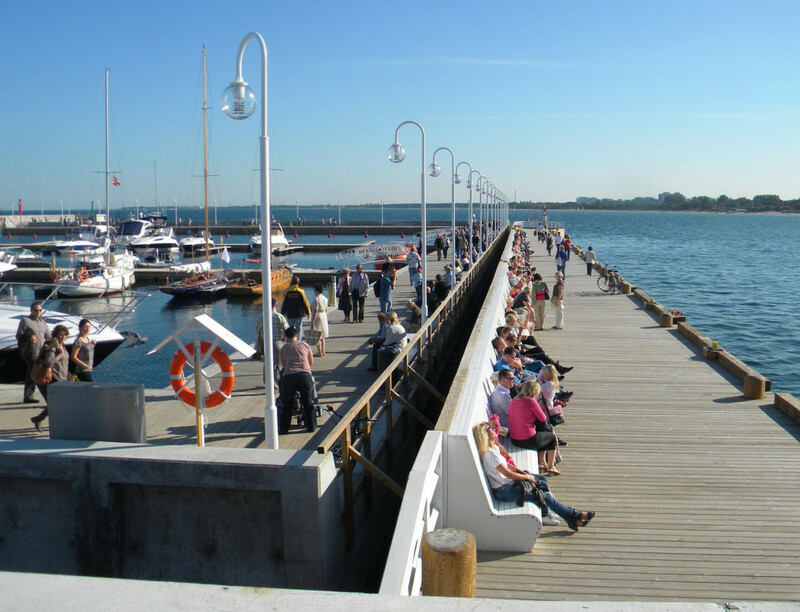 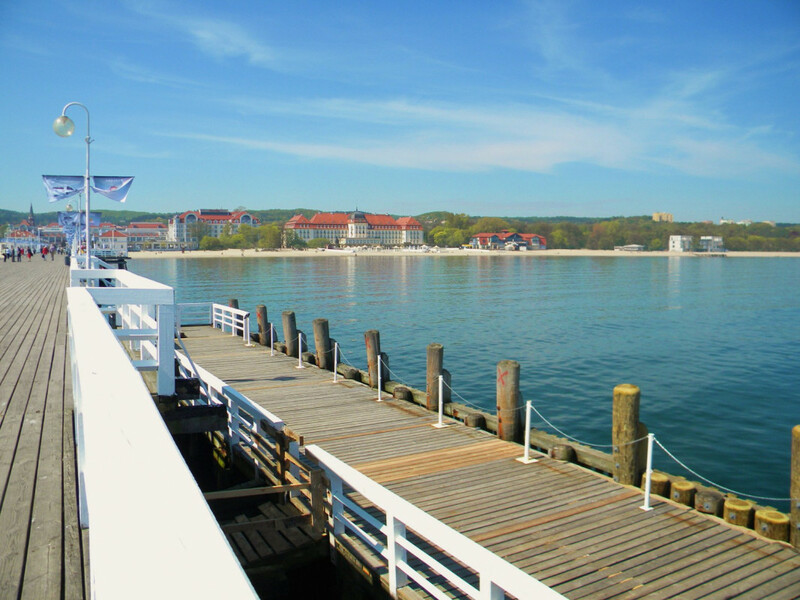 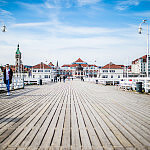 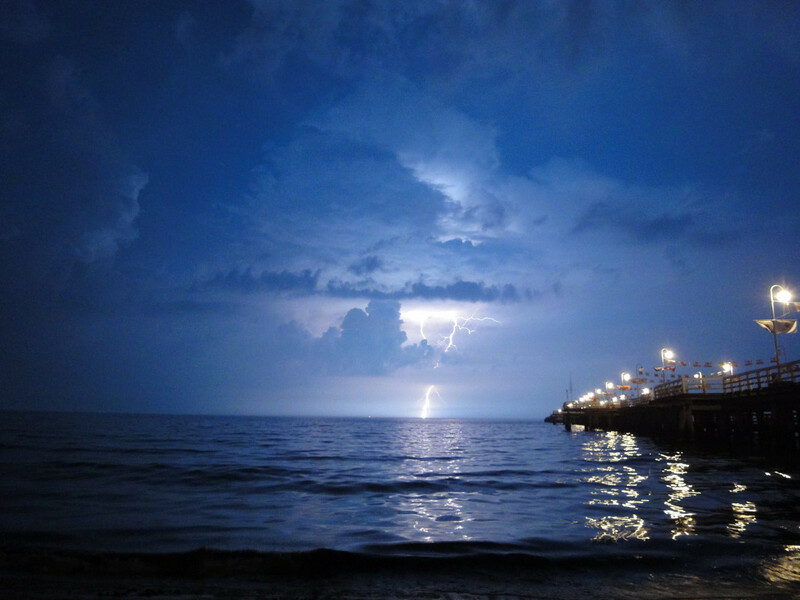 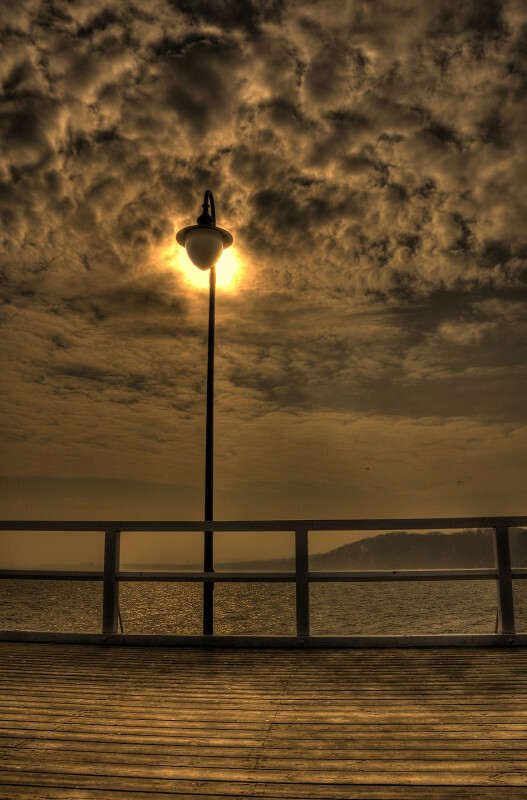 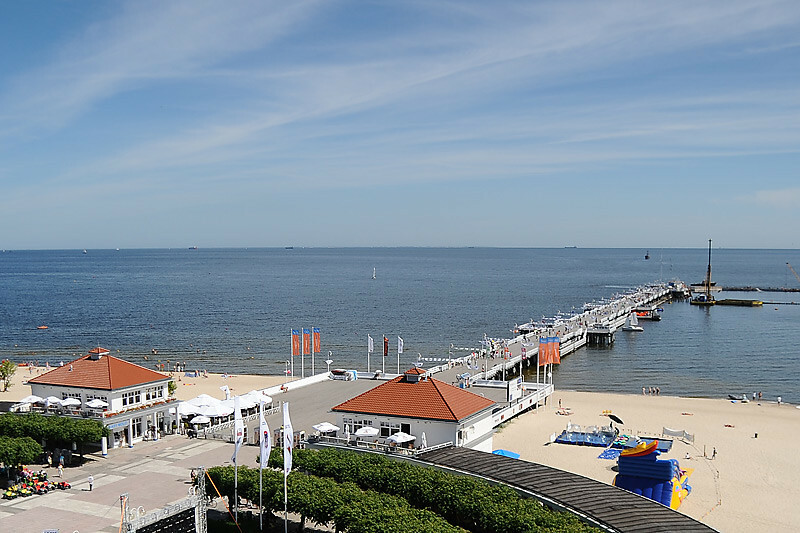 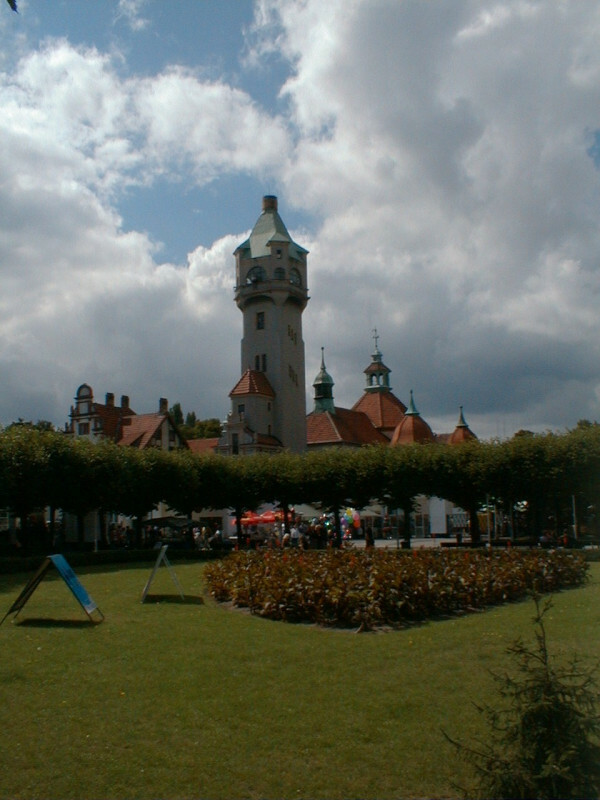 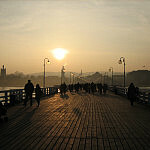 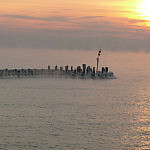 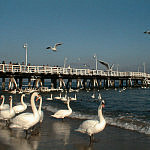 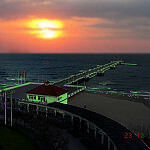 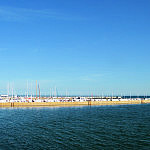 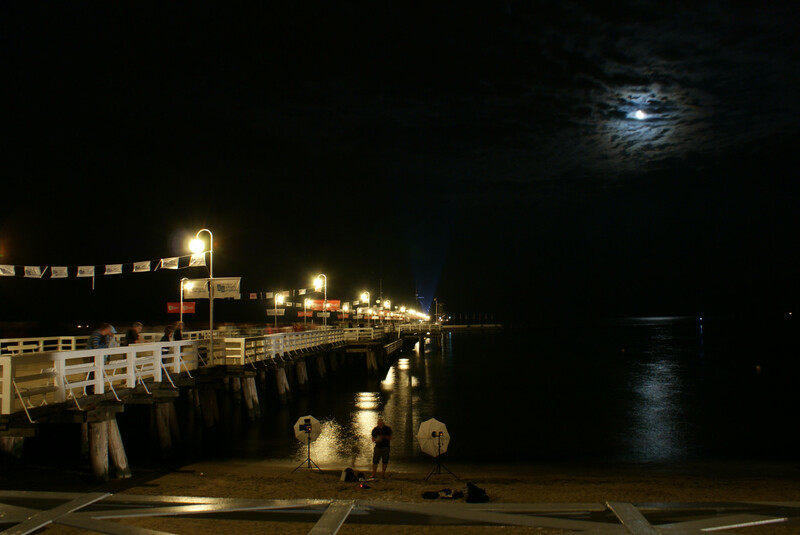 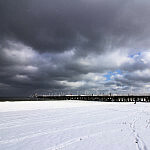 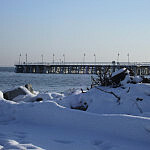 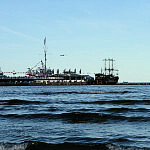 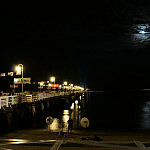 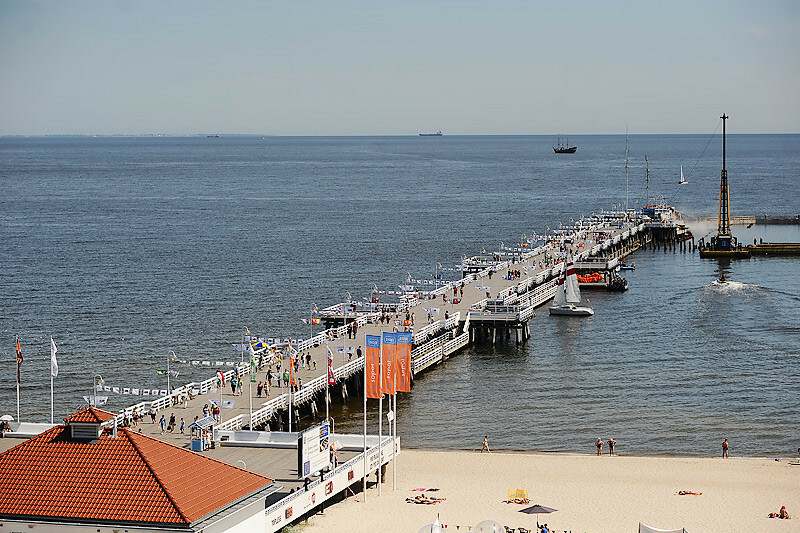 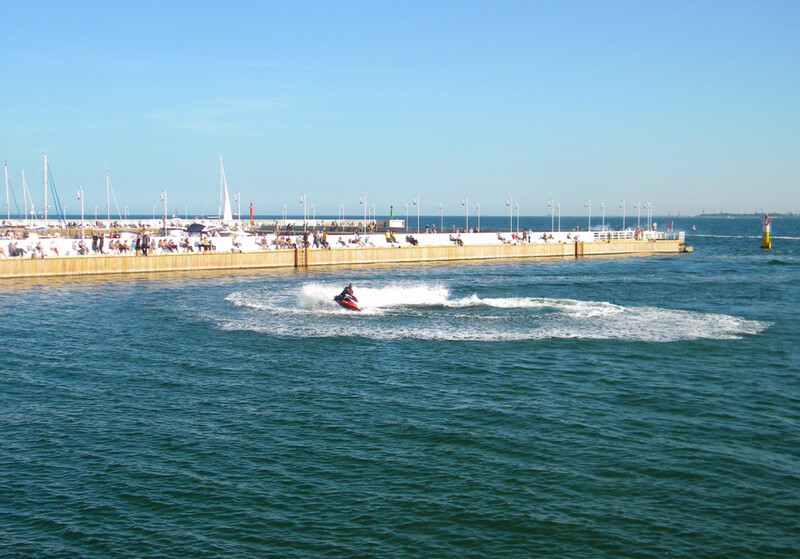 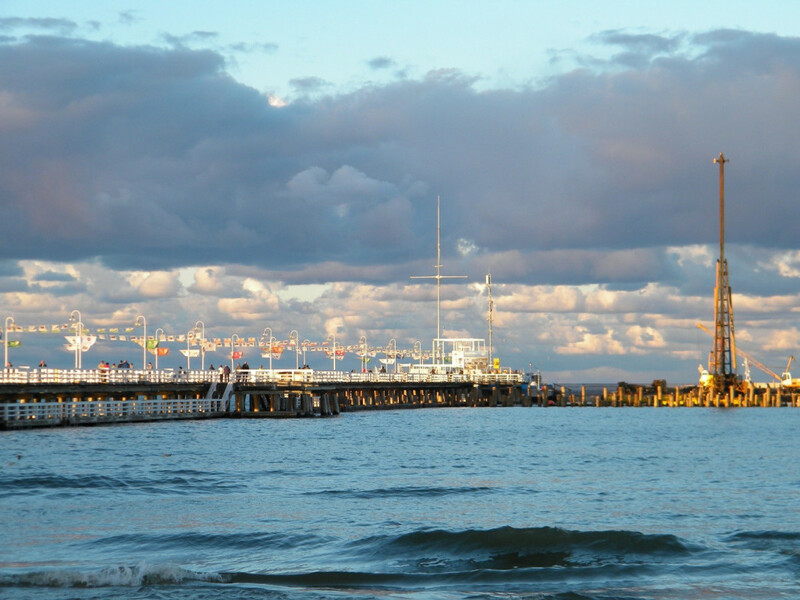 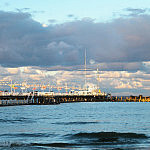 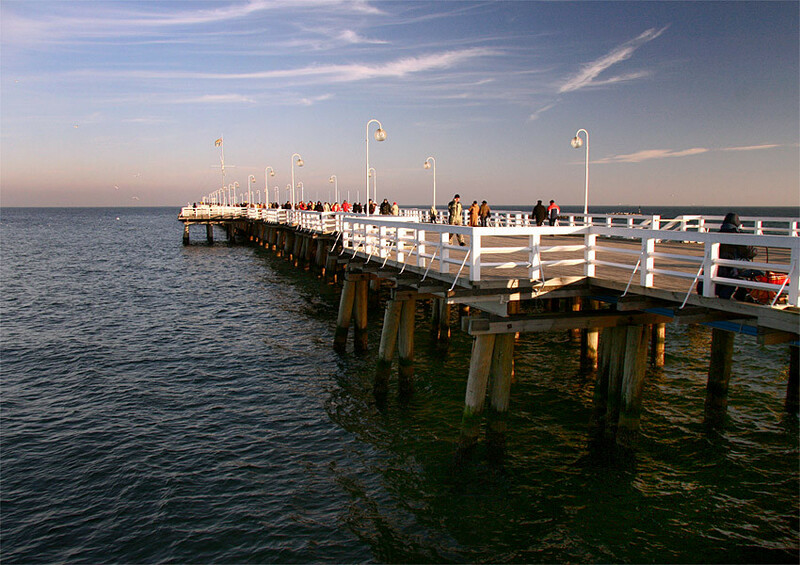 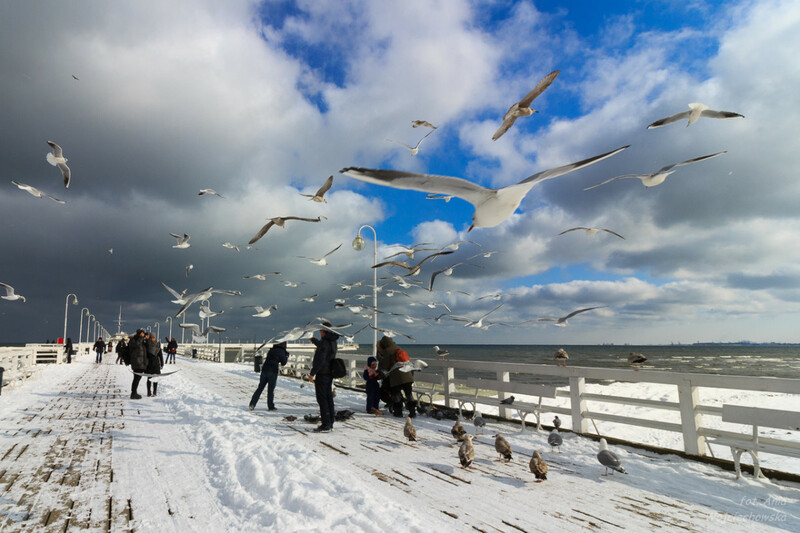 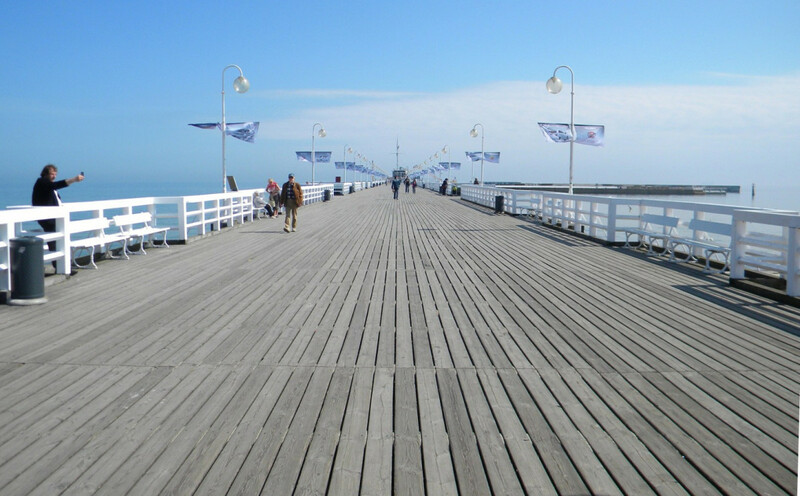 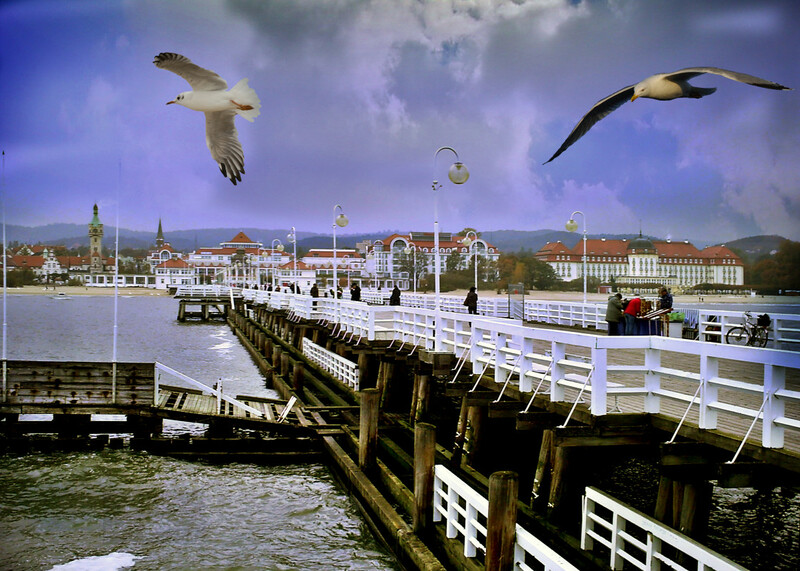 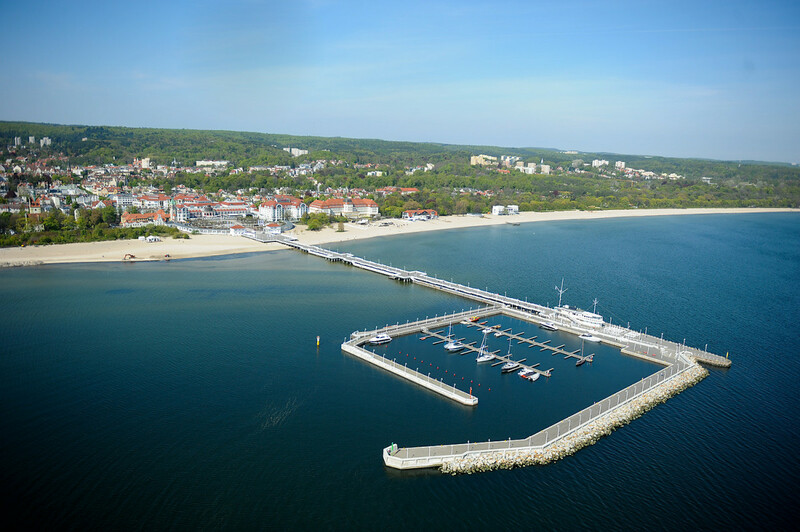 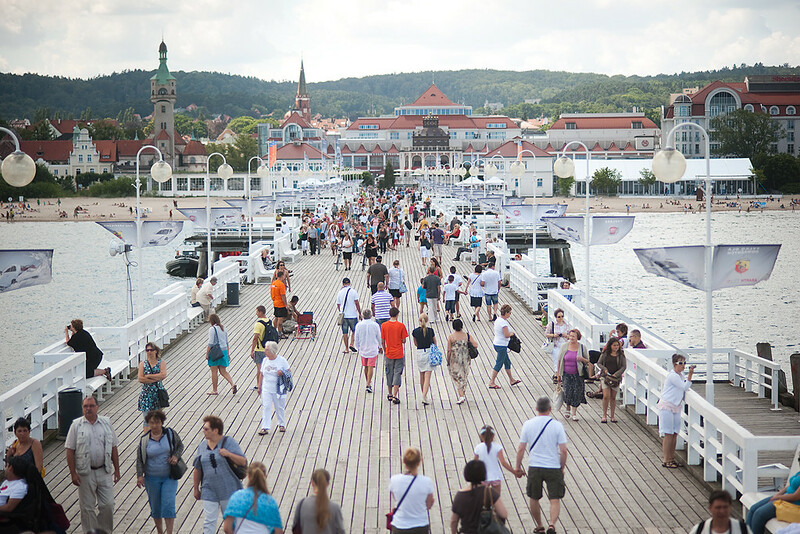 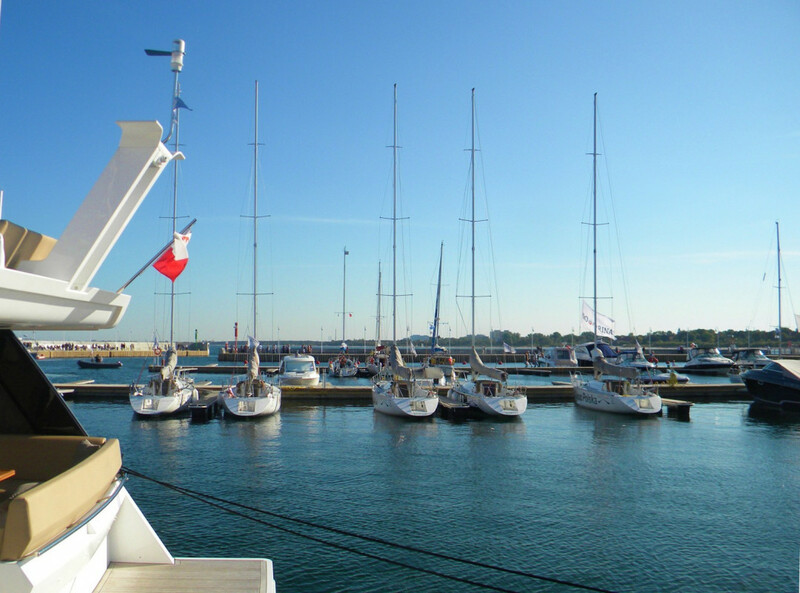 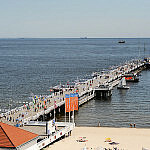 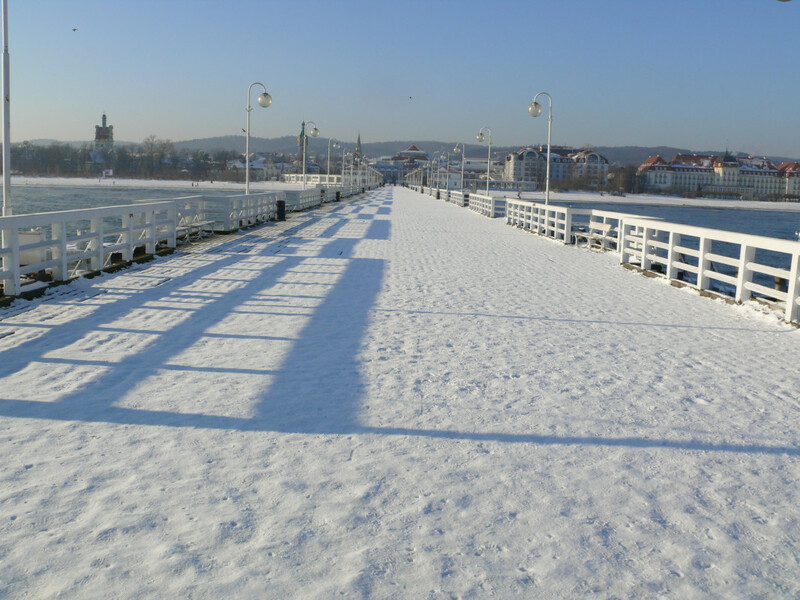 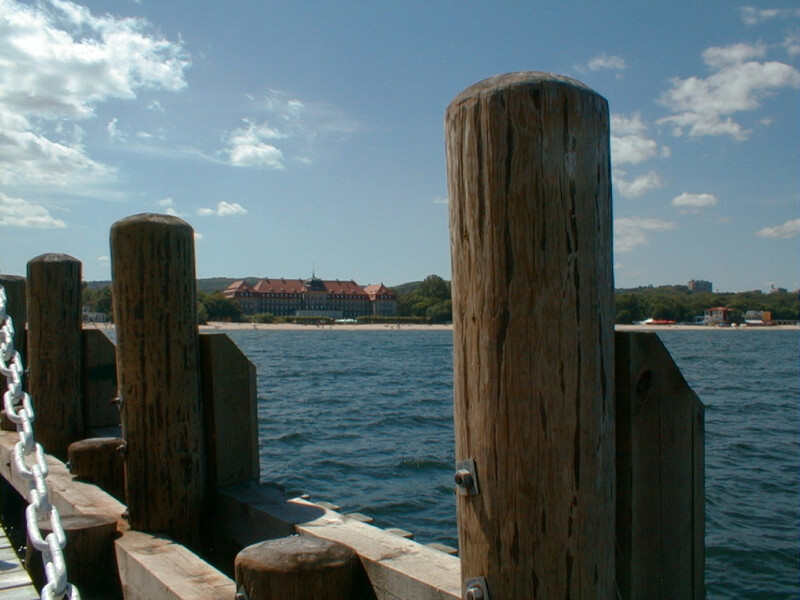 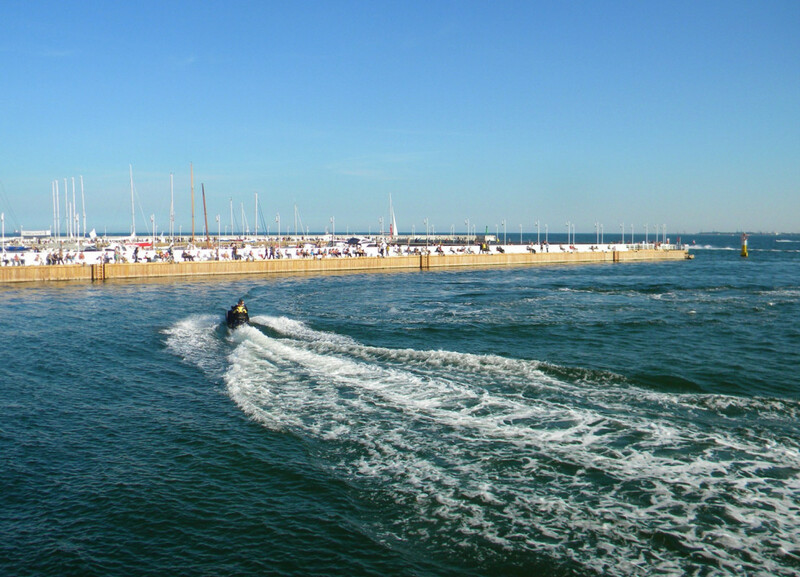 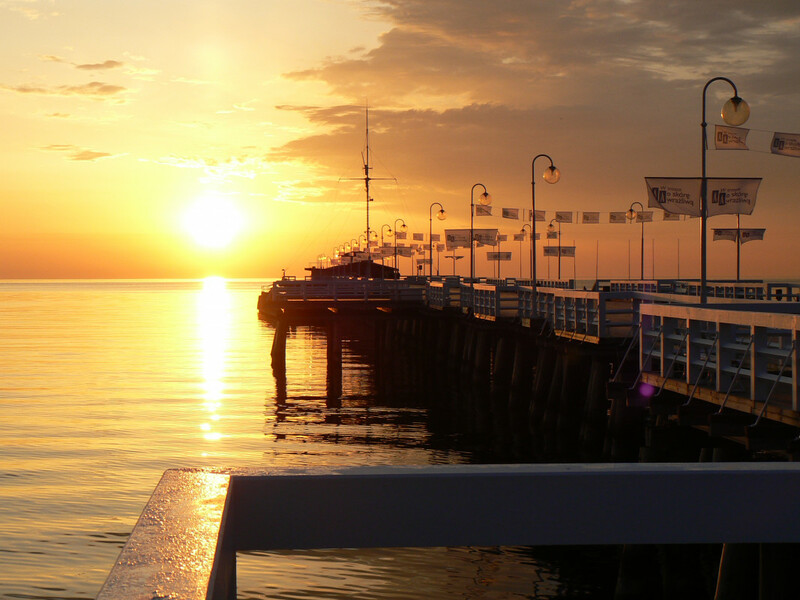 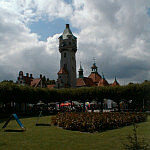 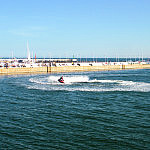 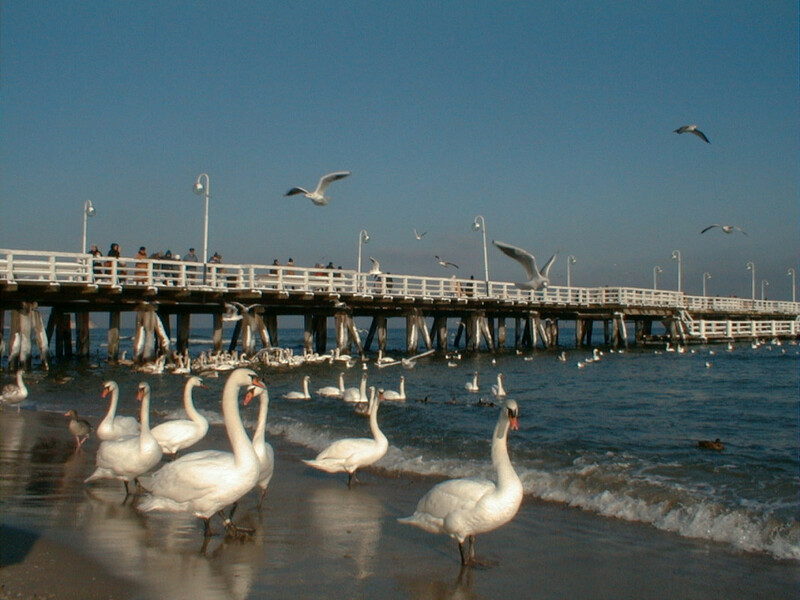 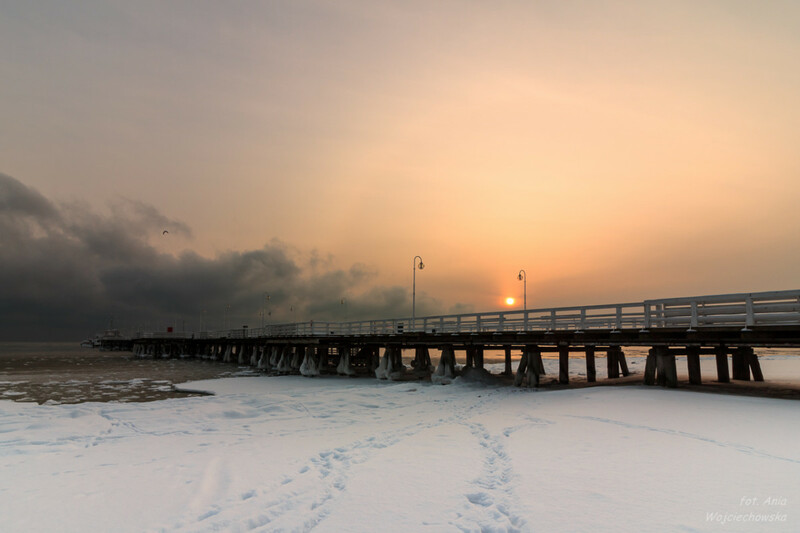 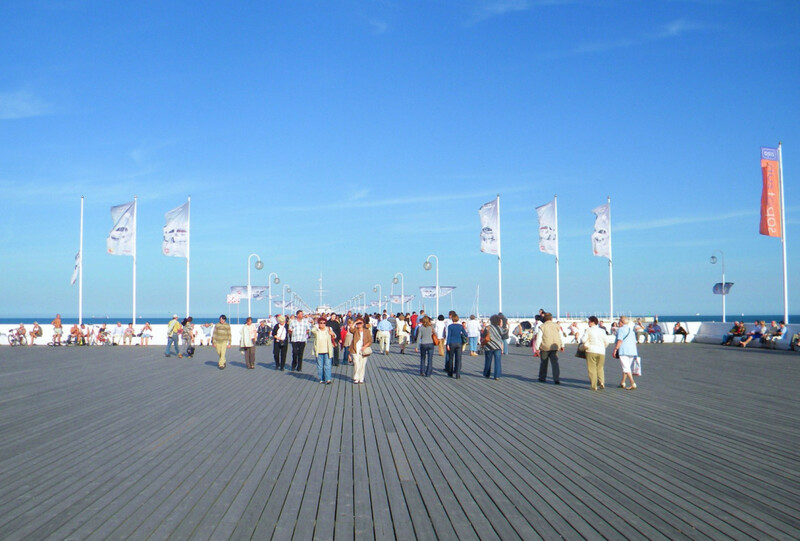 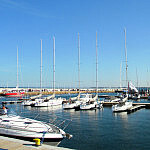 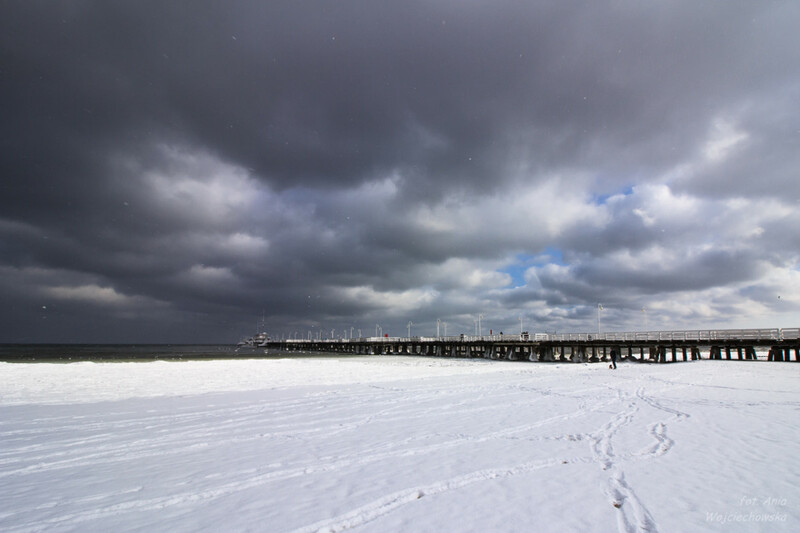 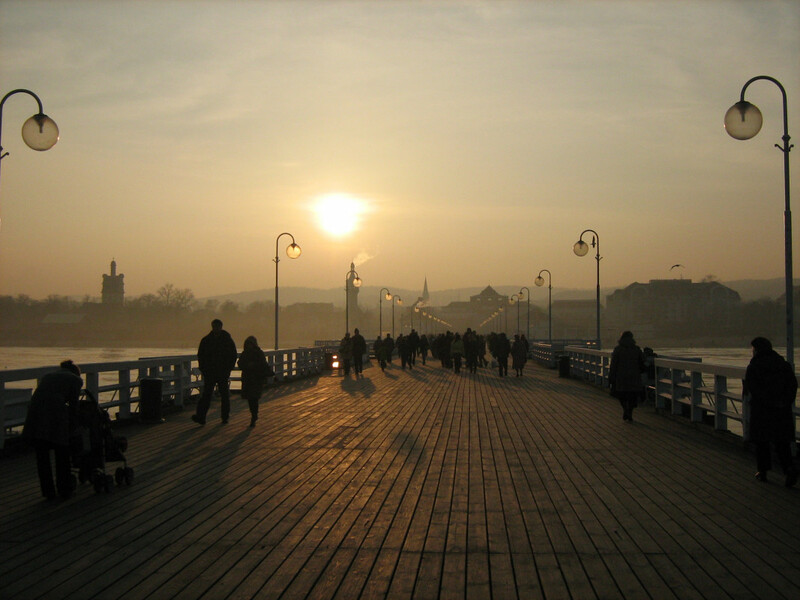 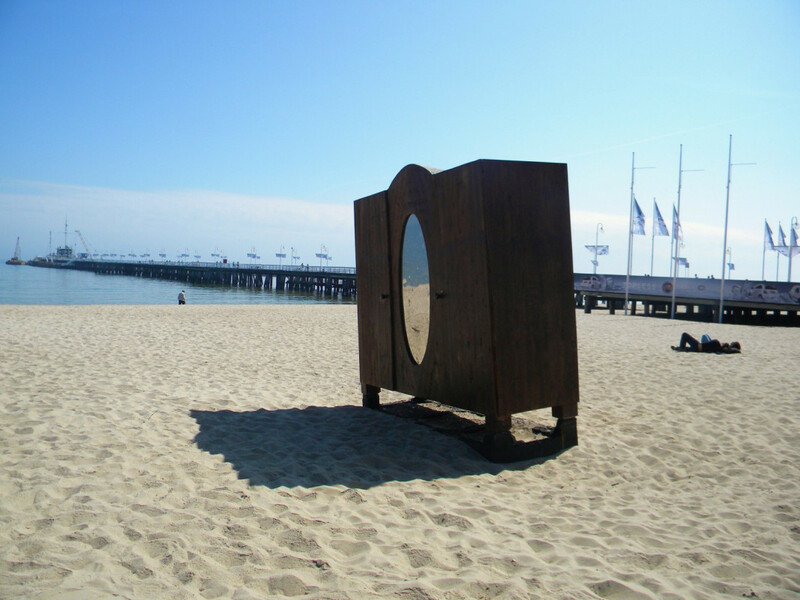 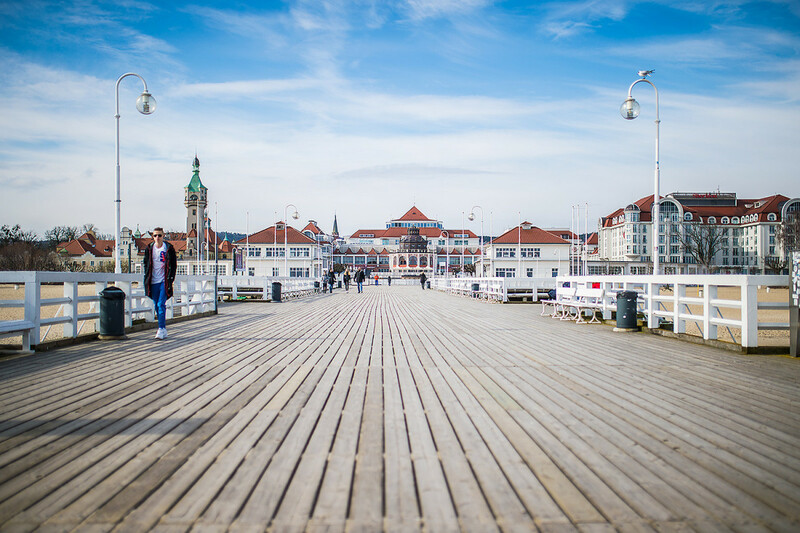 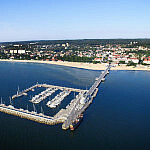 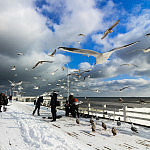 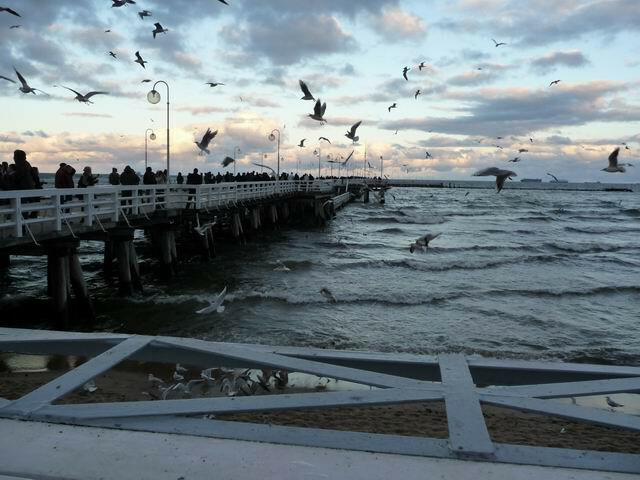 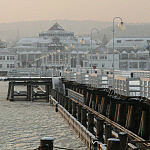 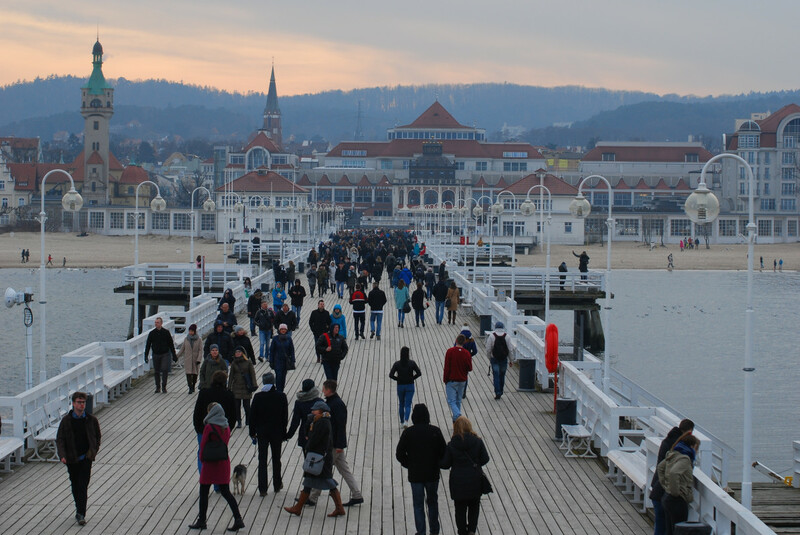 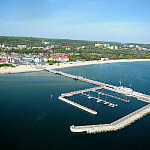 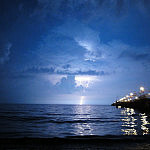 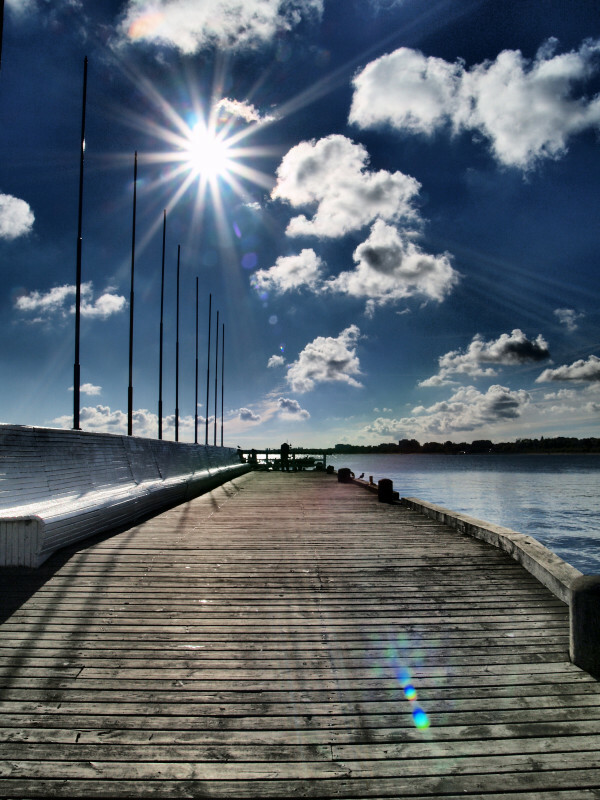 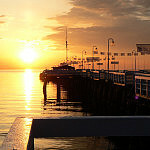 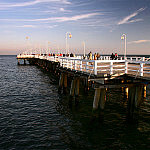 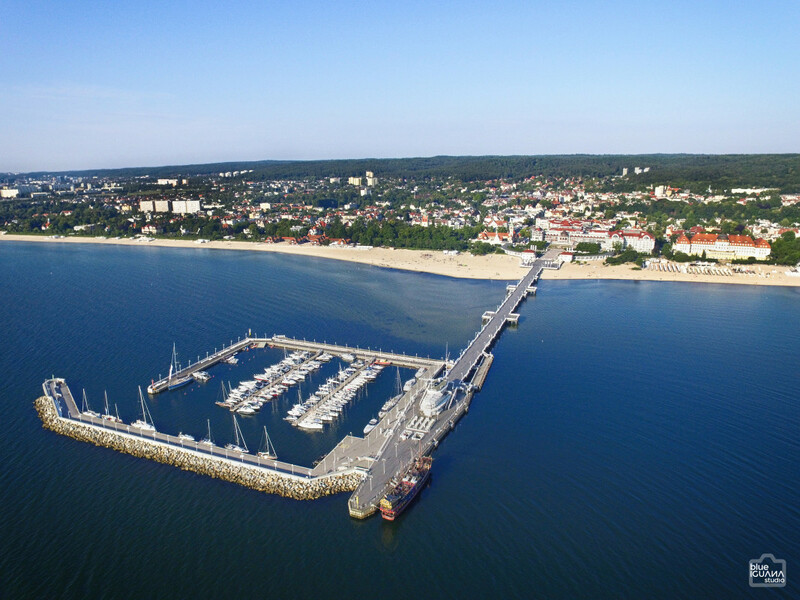 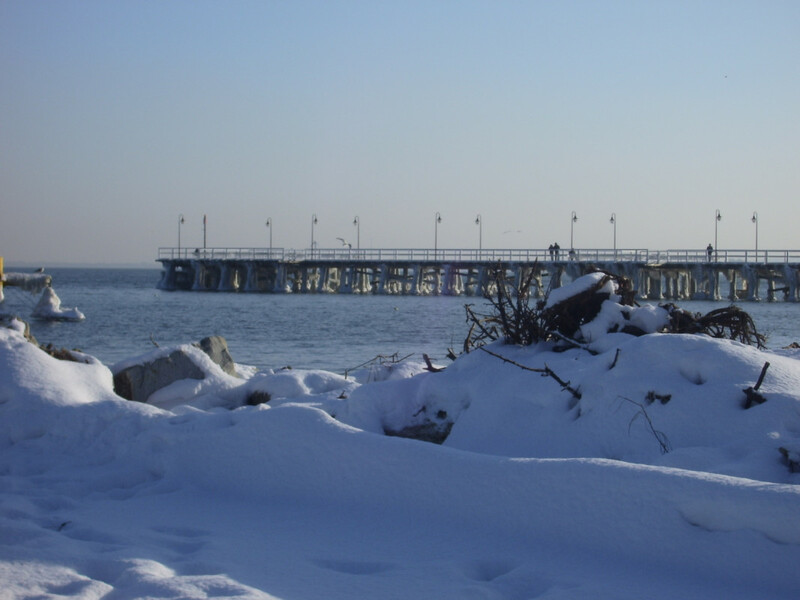 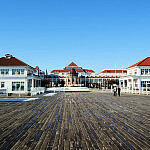 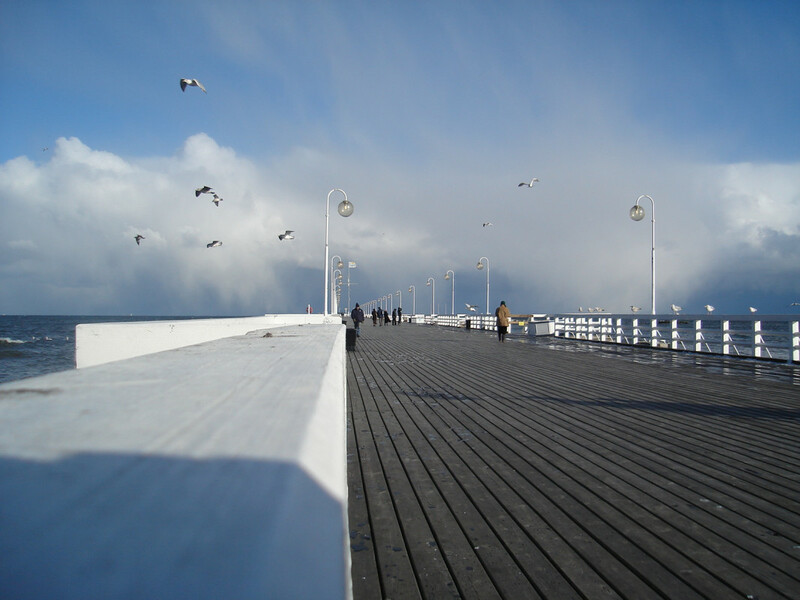 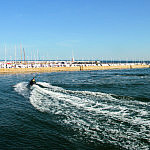 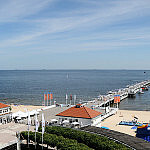 The Pier is one of the most popular Polish tourism and entertainment attractions and is the mascot of this resort. 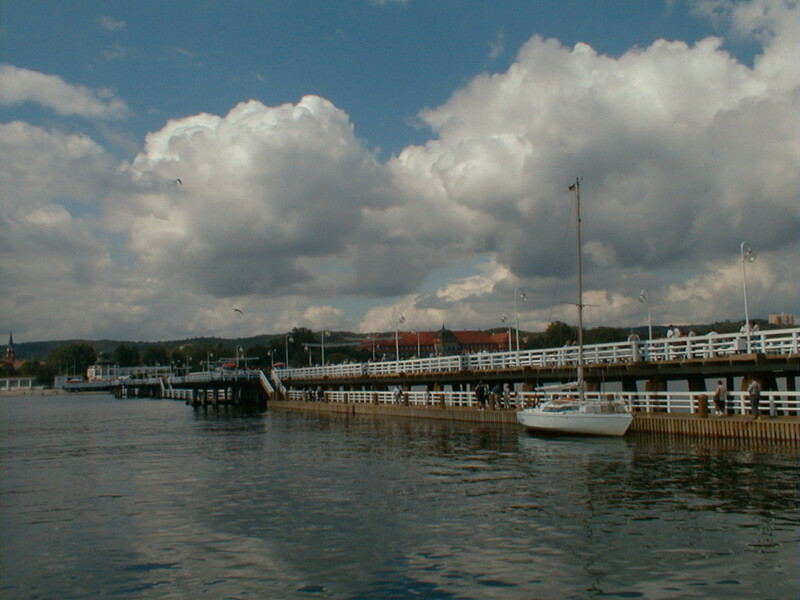 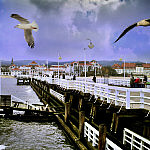 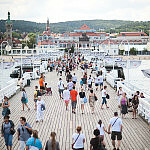 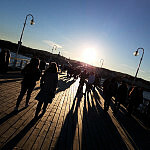 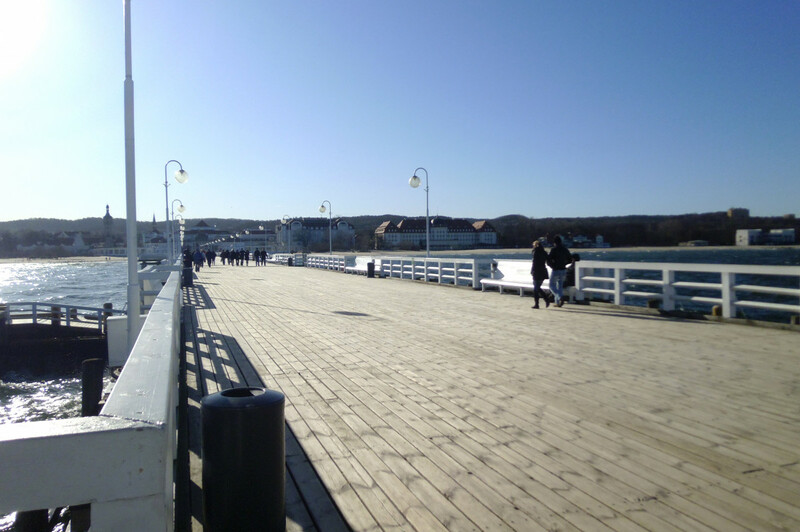 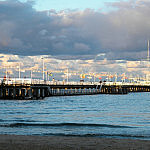 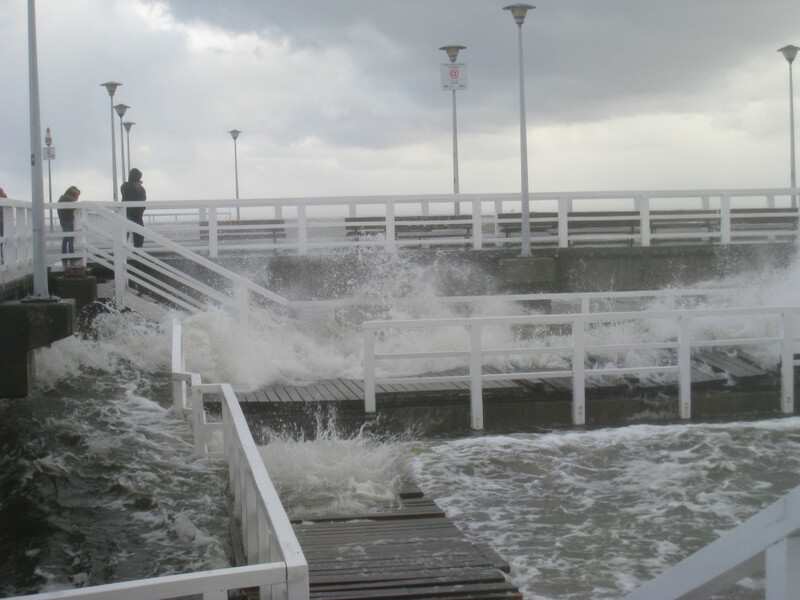 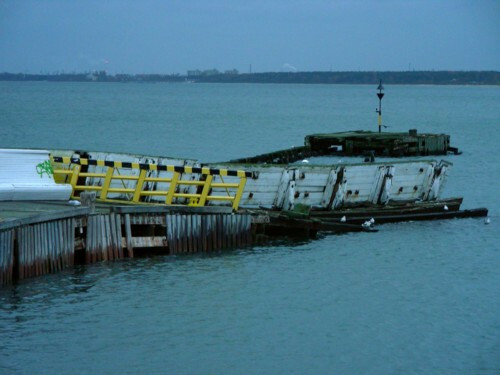 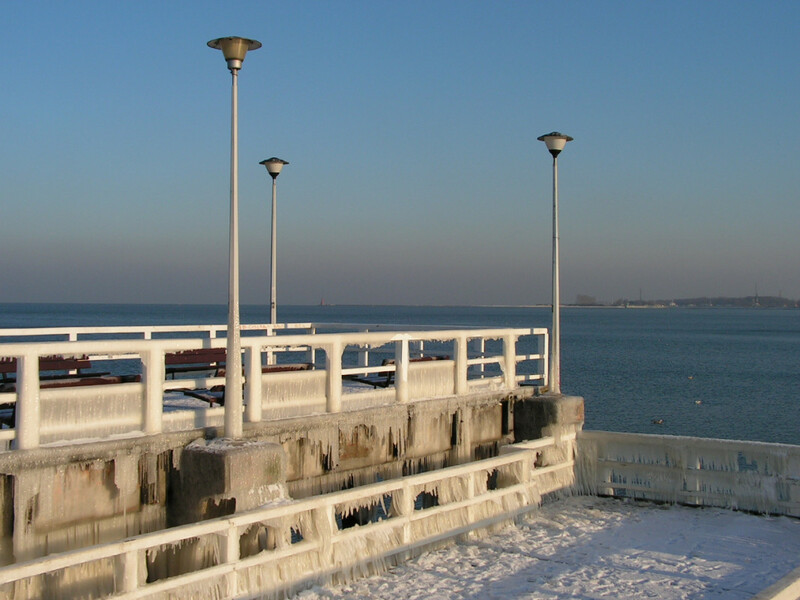 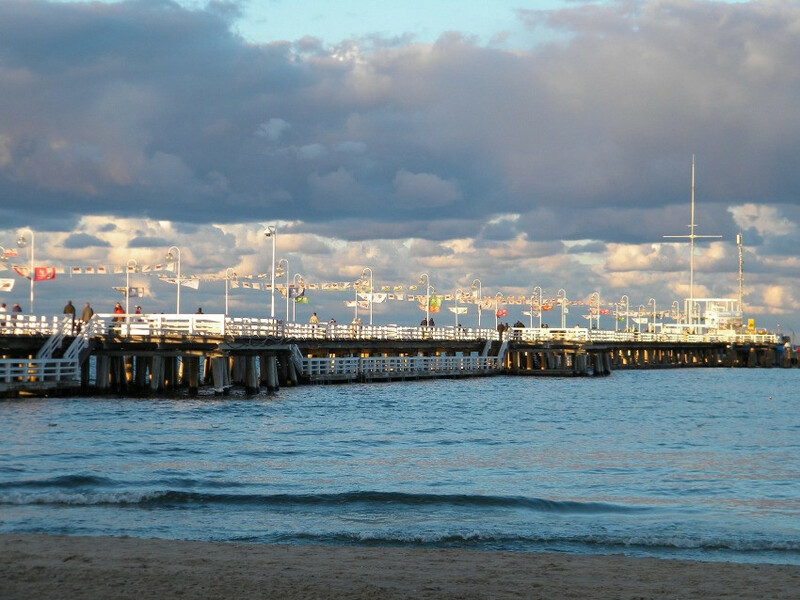 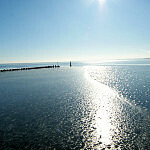 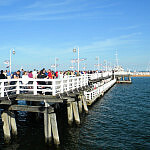 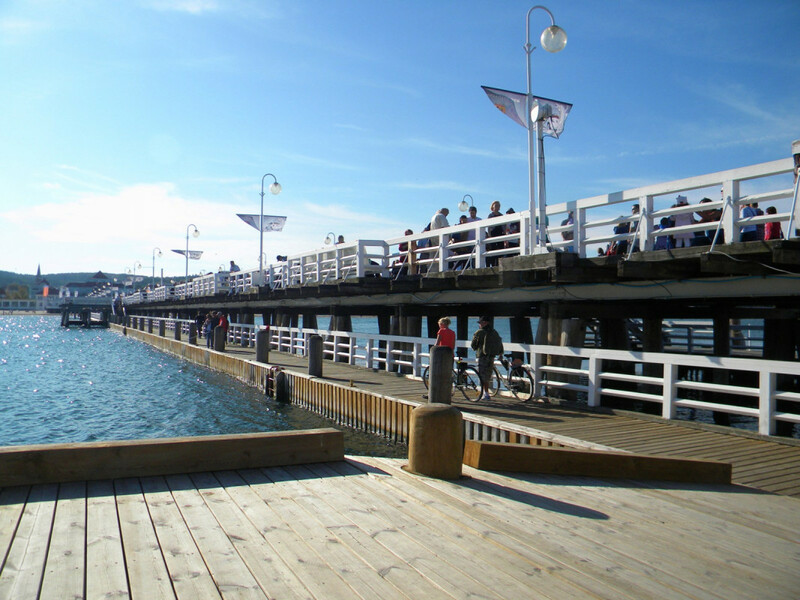 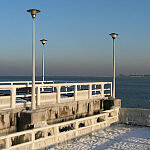 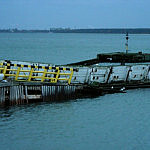 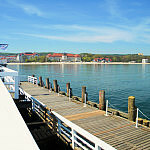 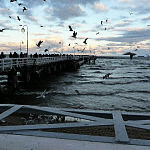 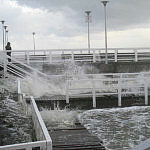 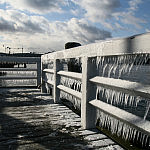 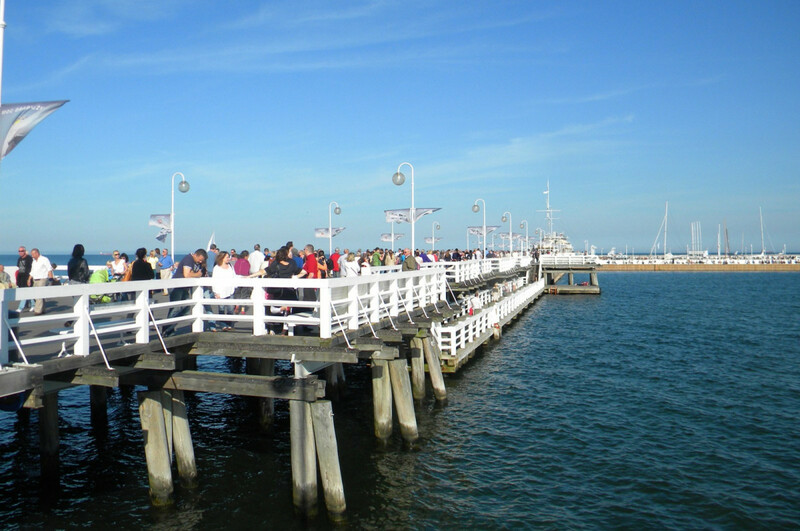 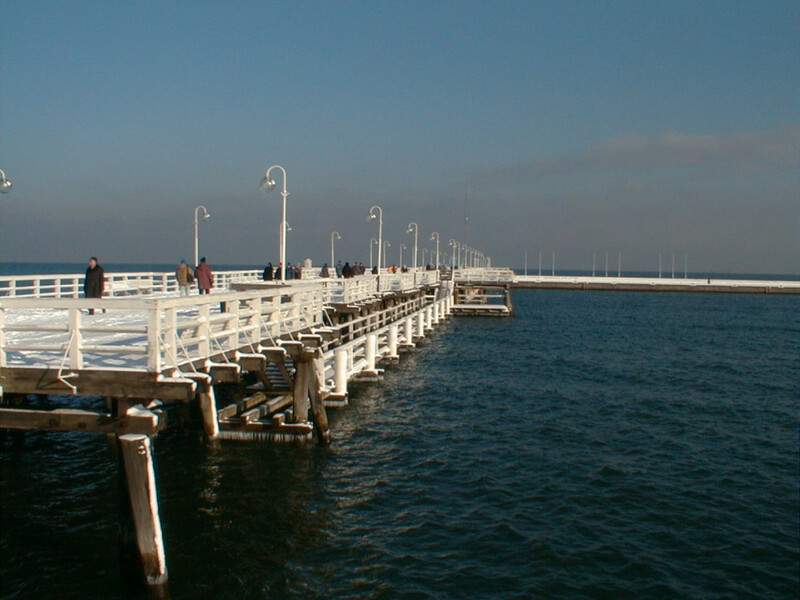 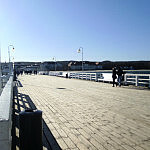 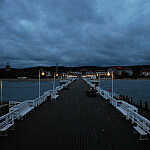 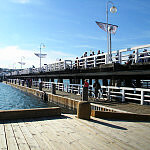 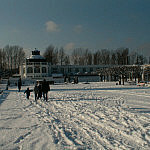 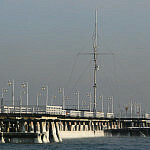 Until May 2009, entrance to the pier is free. 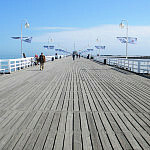 The Pier is one of the most popular Polish tourism and entertainment attractions and is the mascot of this resort. 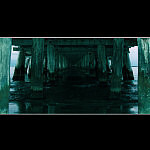 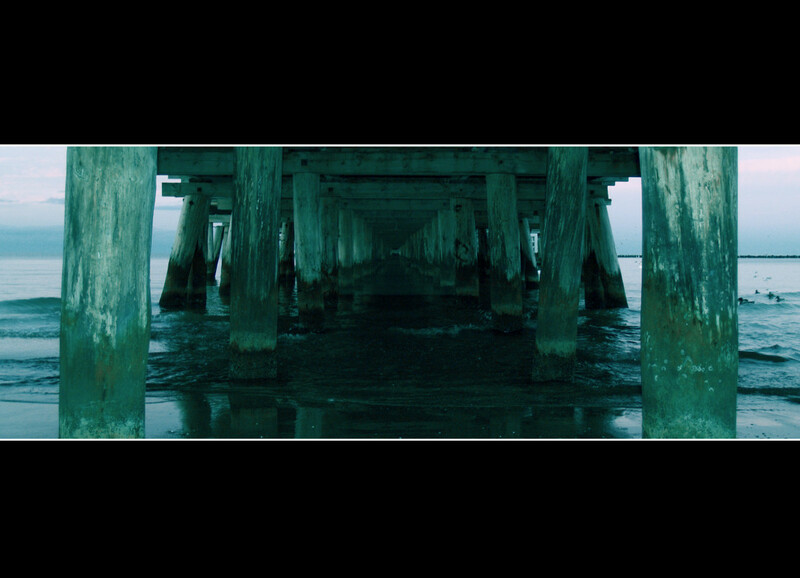 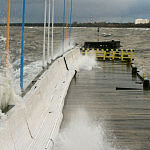 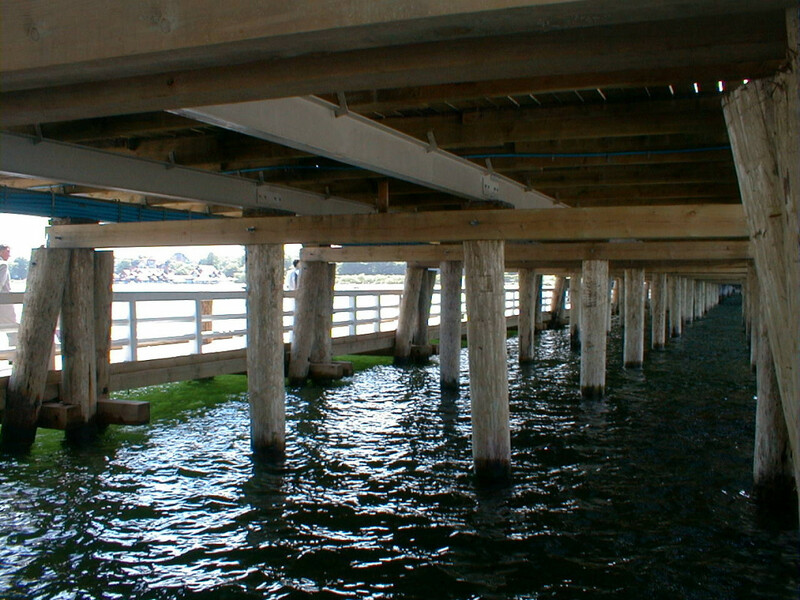 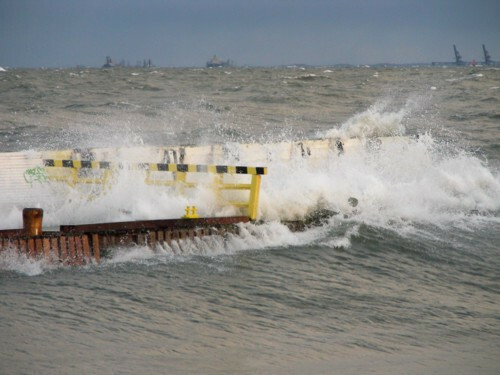 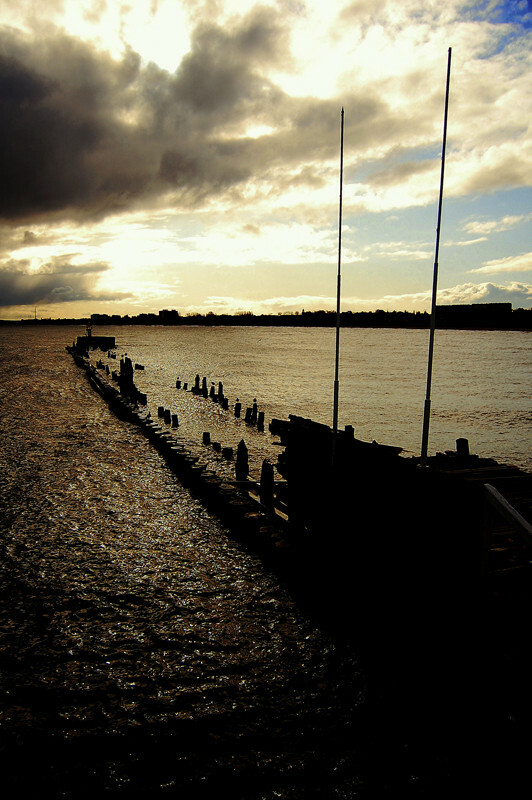 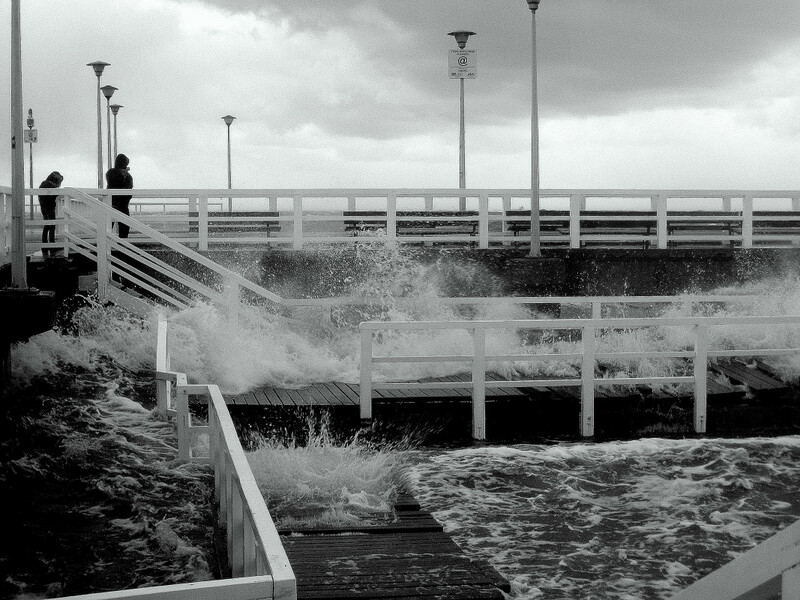 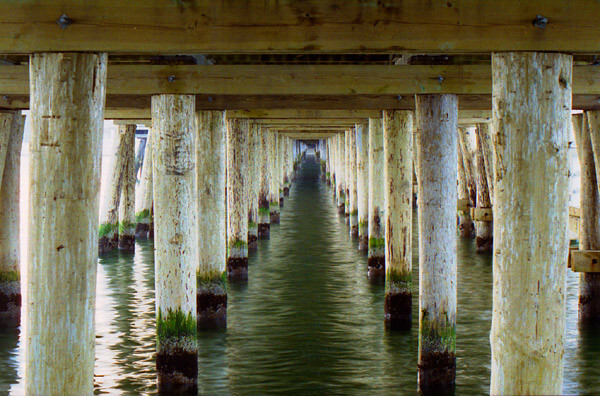 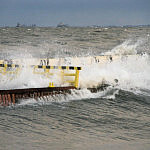 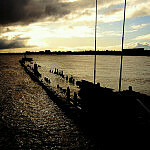 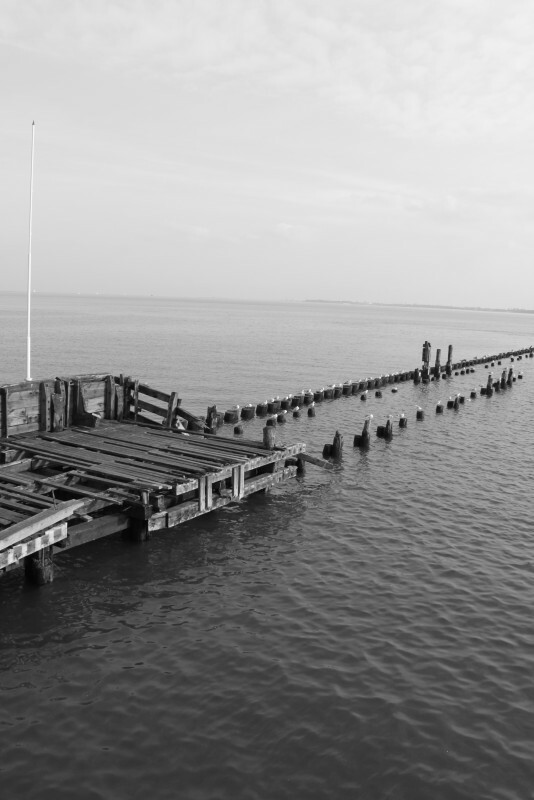 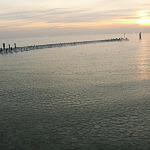 Part of the pier is on land and the rest, made out of wood, extends out into the sea. 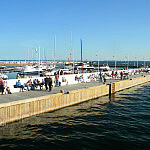 The wooden part is 511,5 m long, with both main and side decks, allowing the docking of passanger boats and yachts. 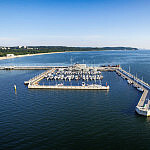 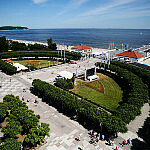 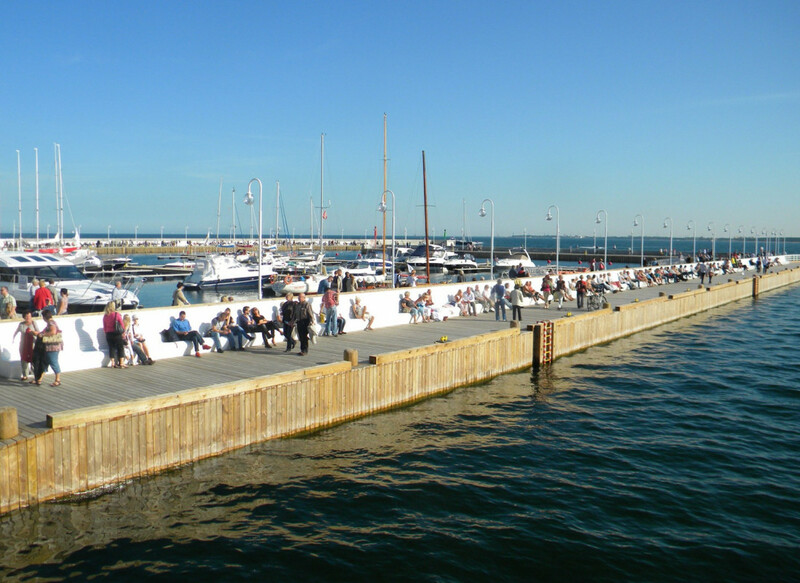 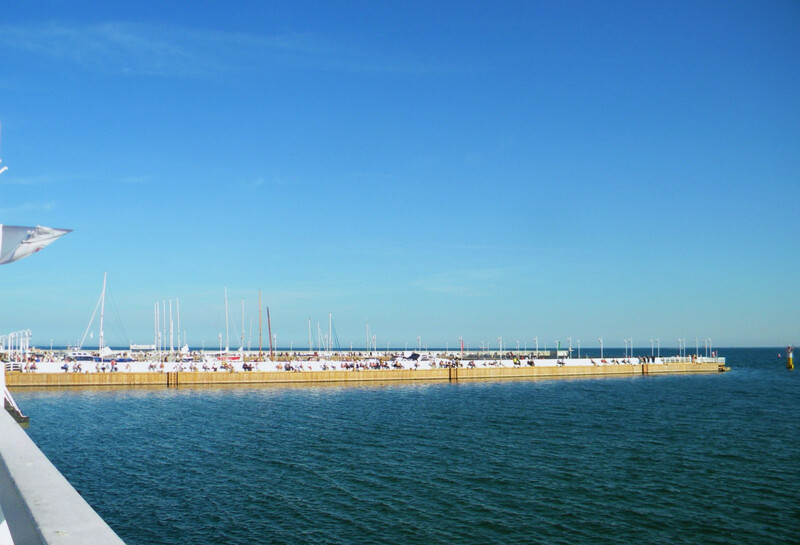 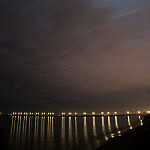 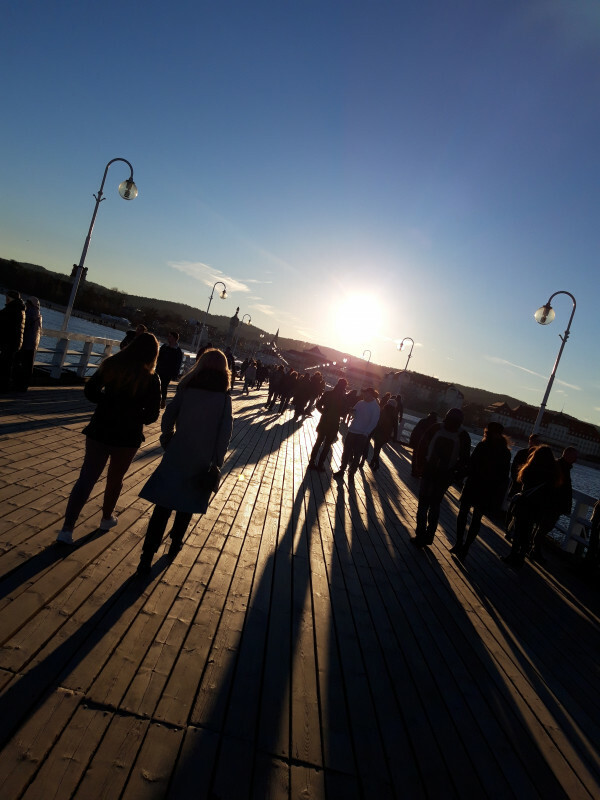 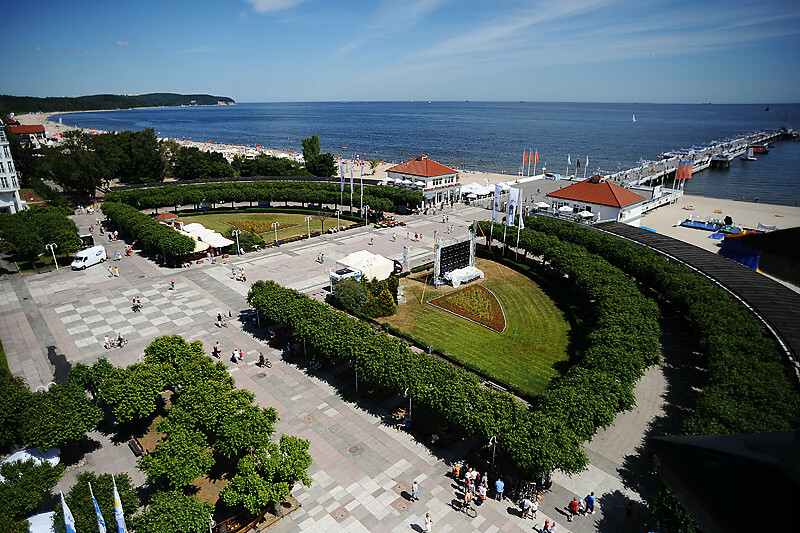 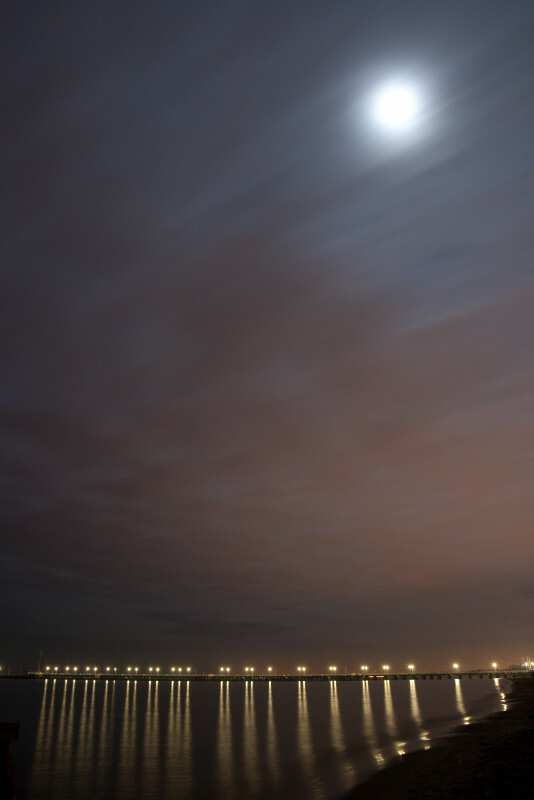 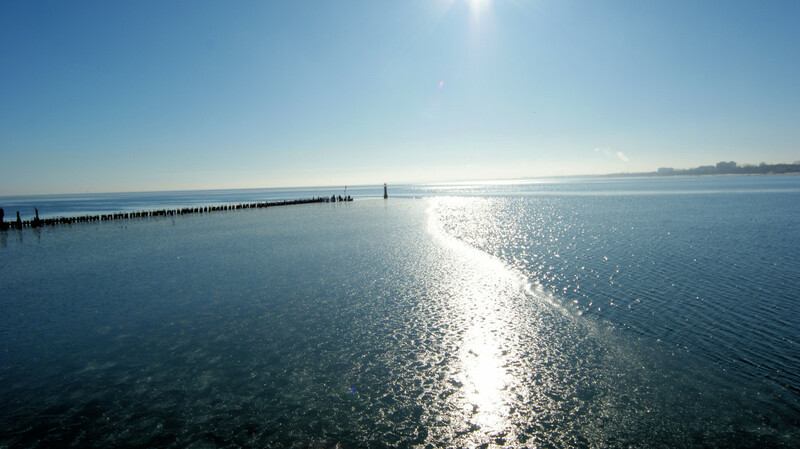 The part of the pier which is on land forms a kind of square of 20,000m2 which holds a beautiful fountain, a lighthouse with an observation platform, a concert stage, food outlets and a green area. 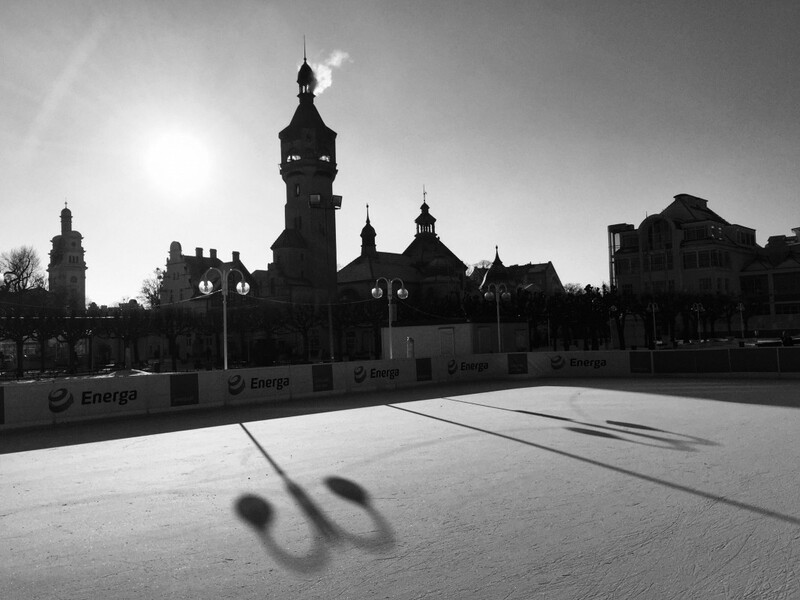 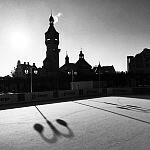 The square can hold concerts with a maximum capacity of 15,000 people while in winter time part of it is transformed into an ice rink. 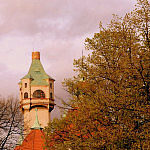 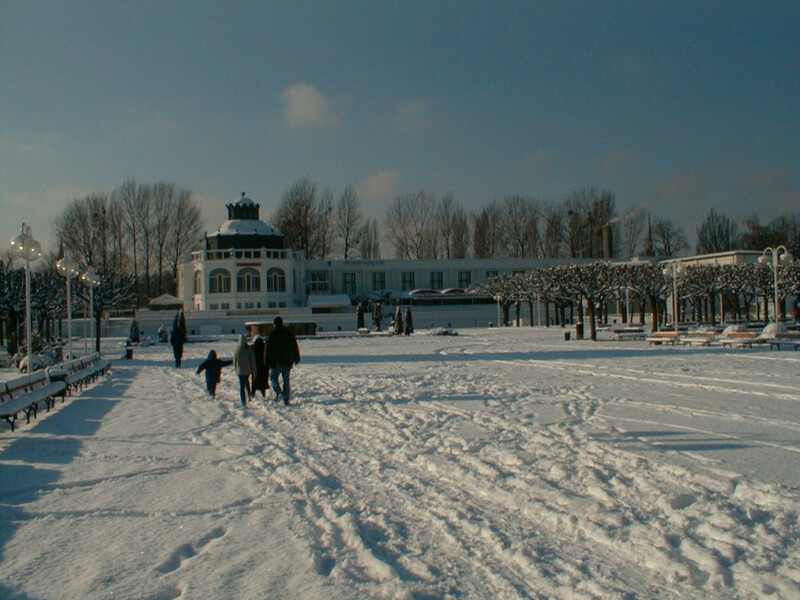 Cafe Bursztynowa and the restaurant Fregata are open all year round. 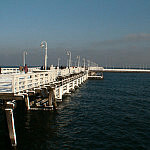 Until May 2009, entrance to the pier is free. 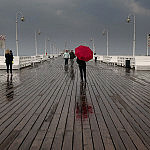 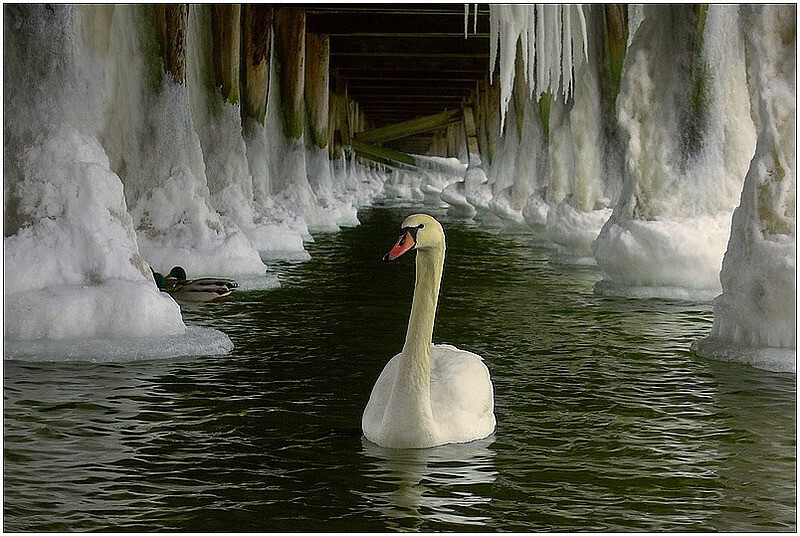 Please pay careful attention to the varying atmospheric conditions (strong winds, ice, slippy planks etc) from autumn to spring. 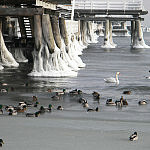 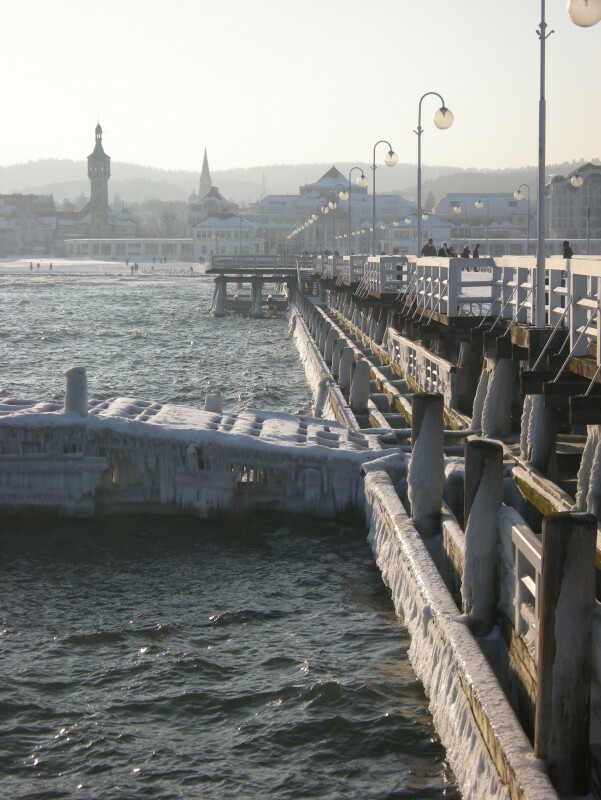 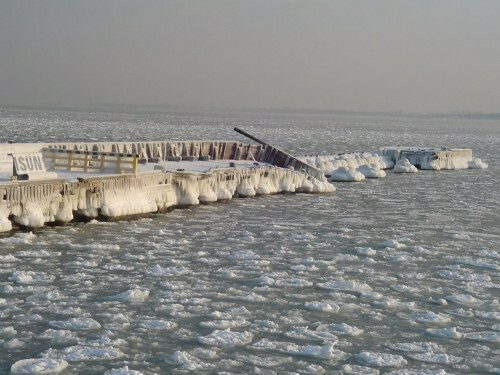 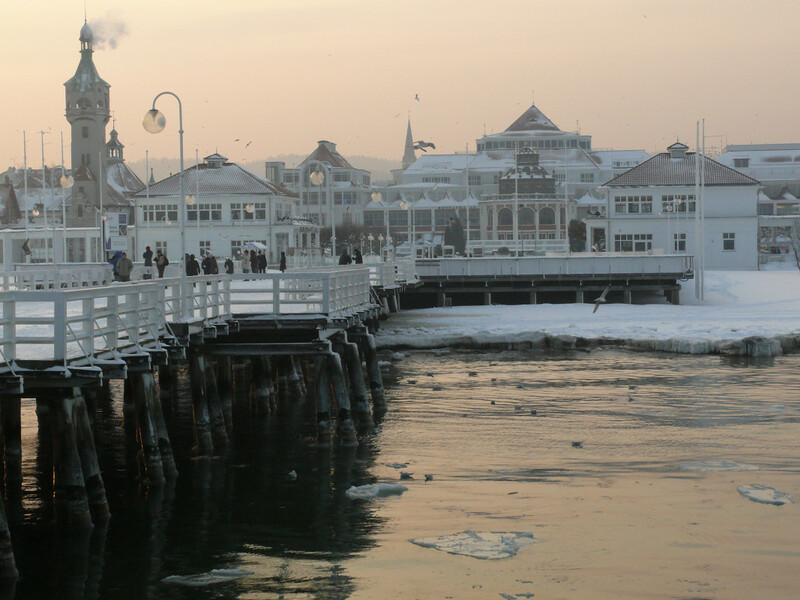 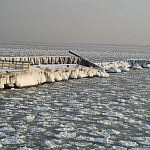 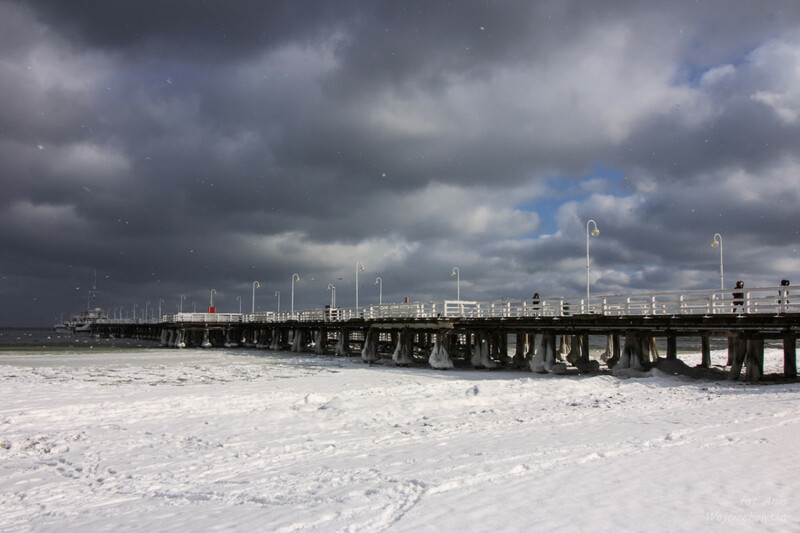 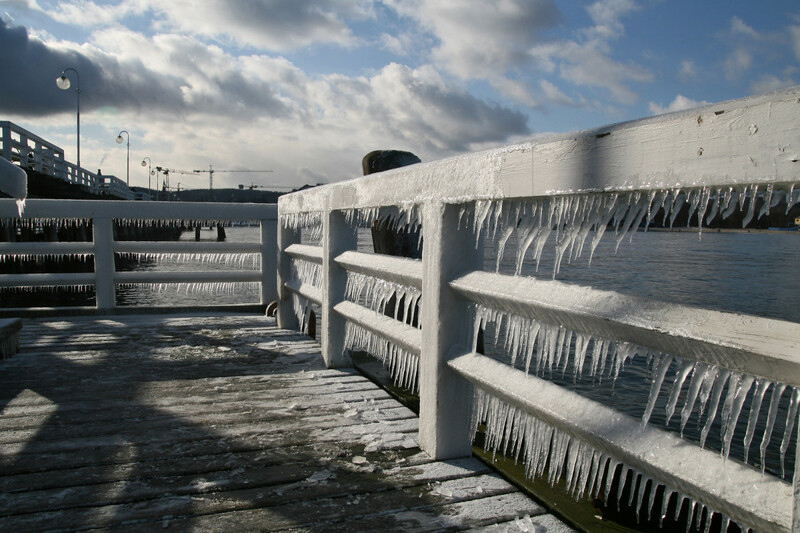 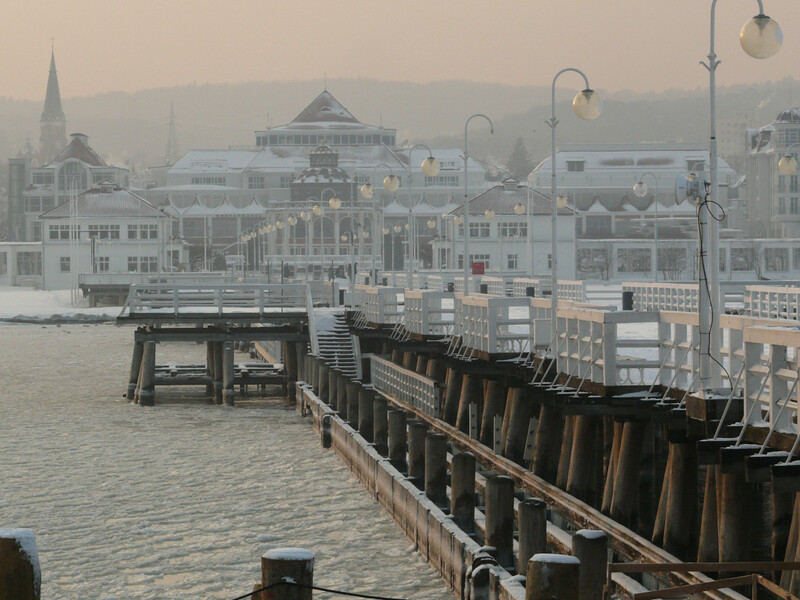 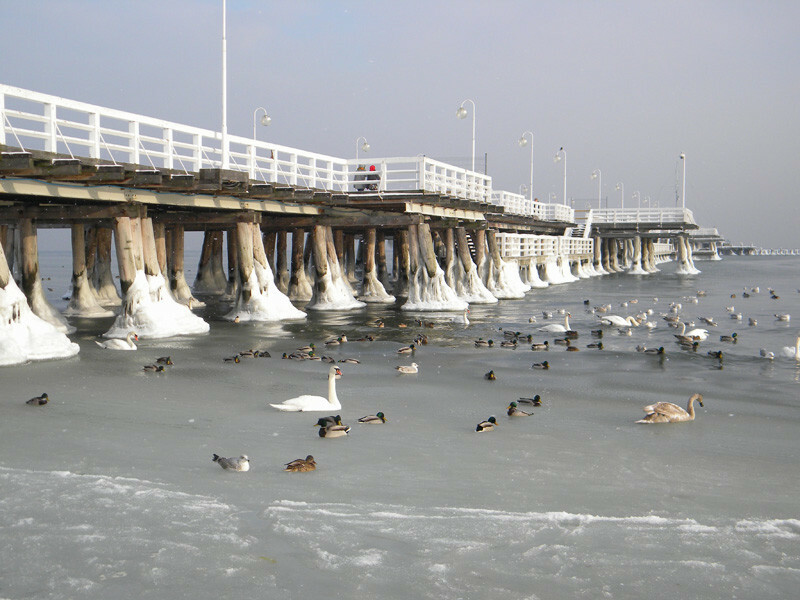 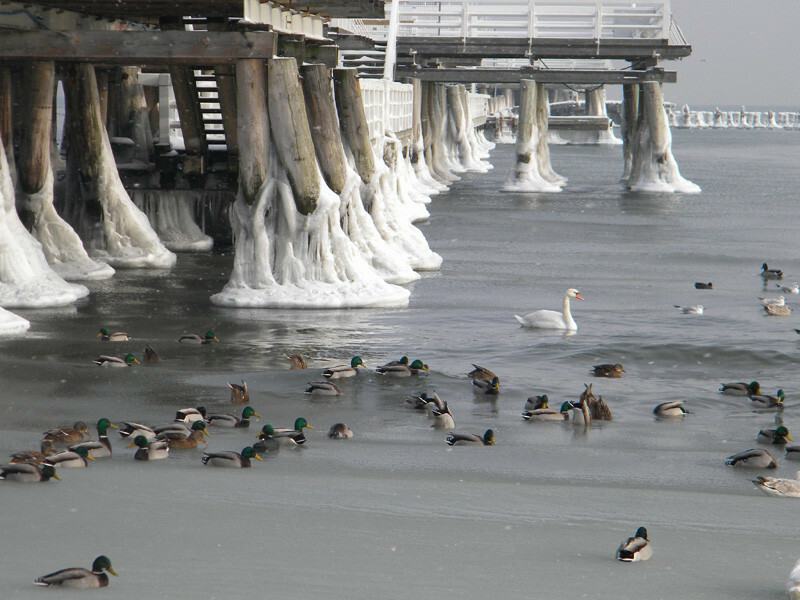 Winter attractions on the pier: the ice rink. 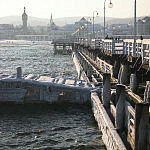 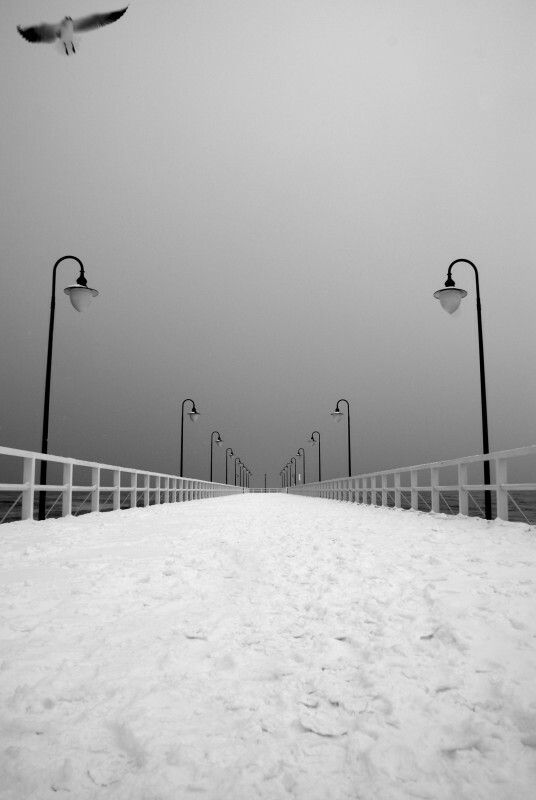 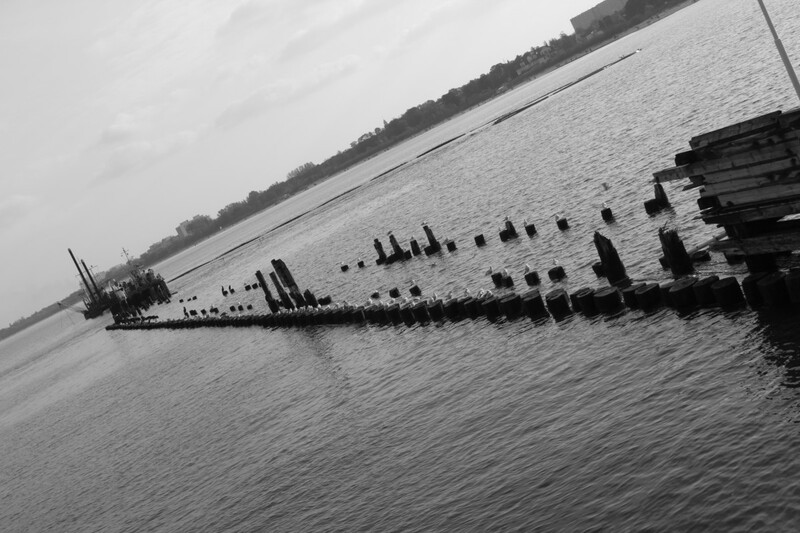 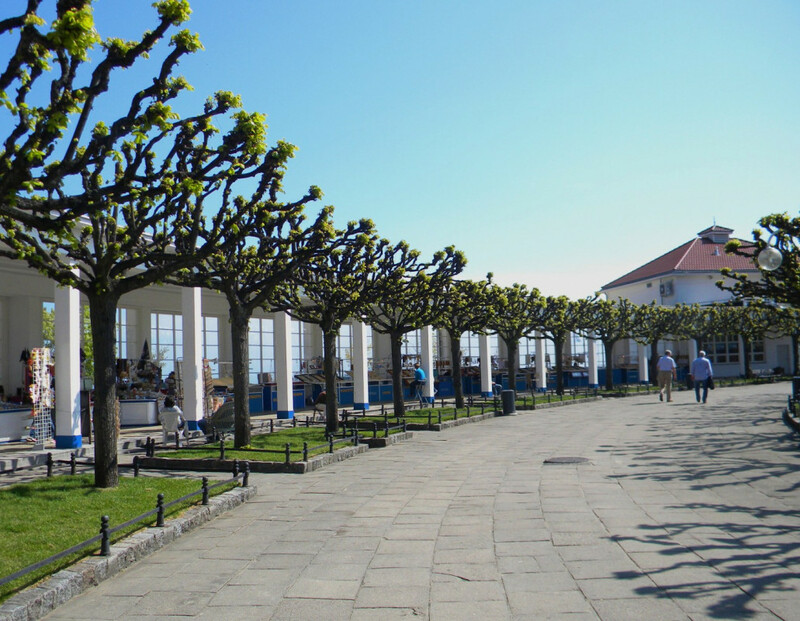 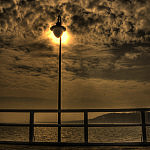 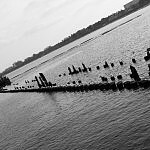 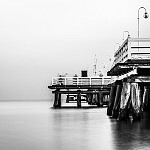 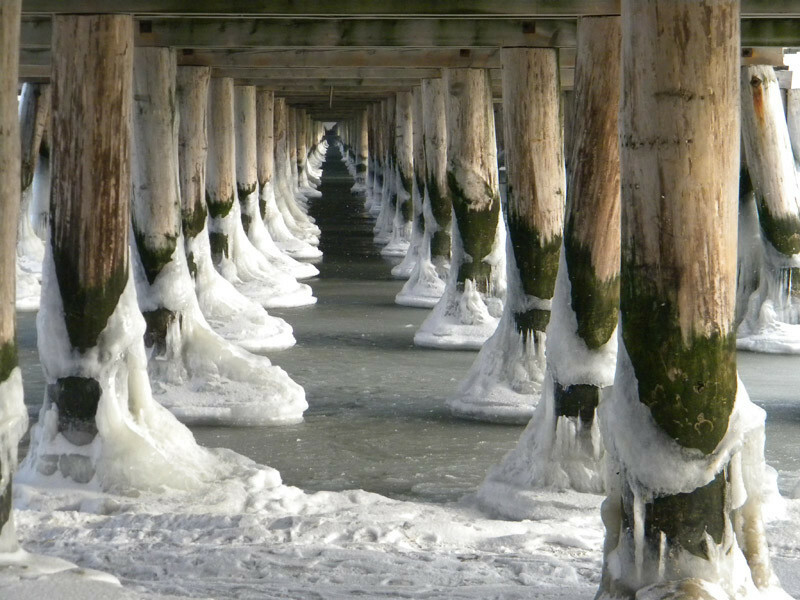 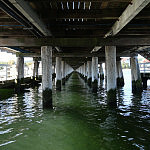 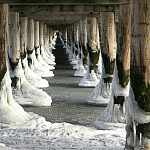 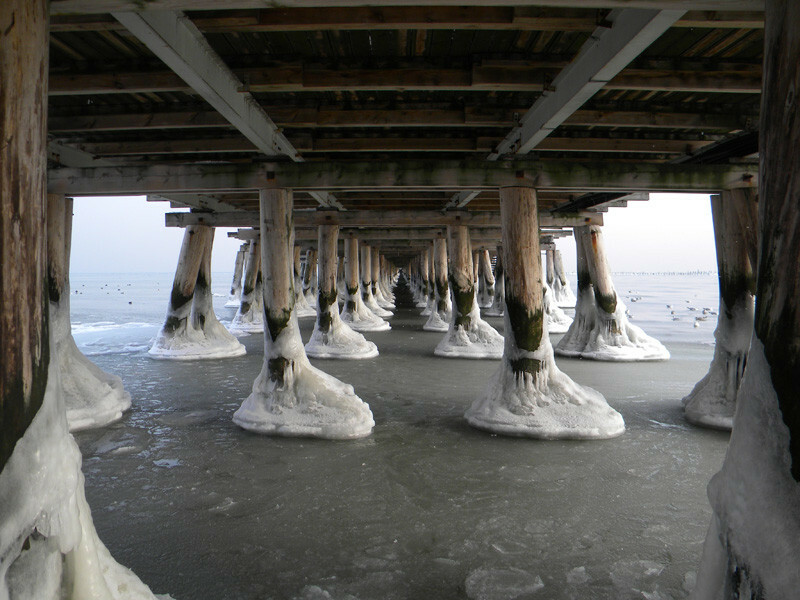 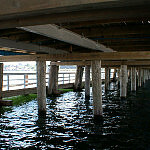 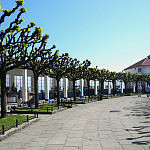 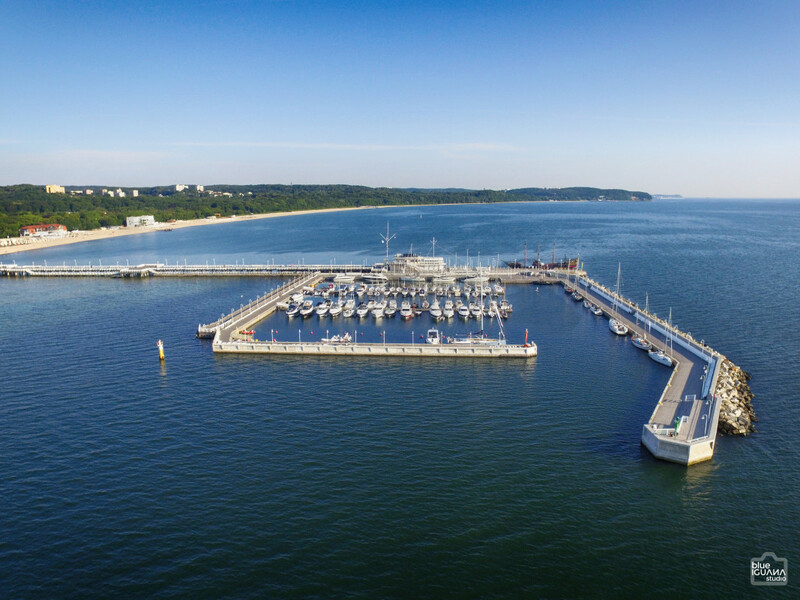 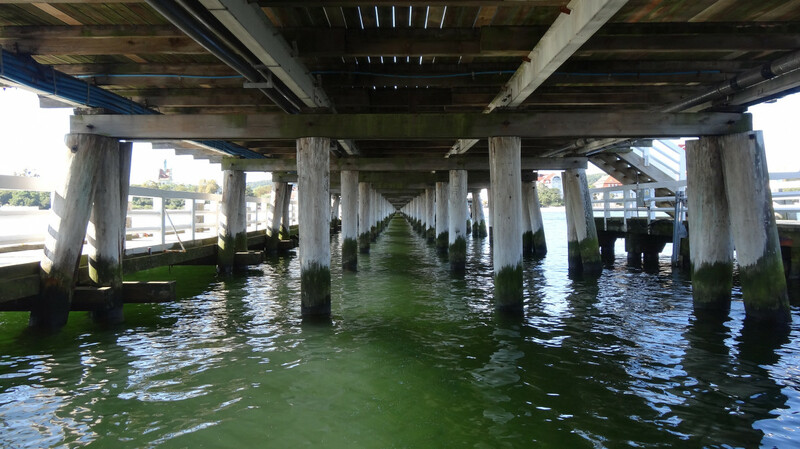 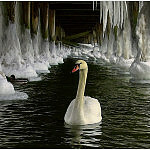 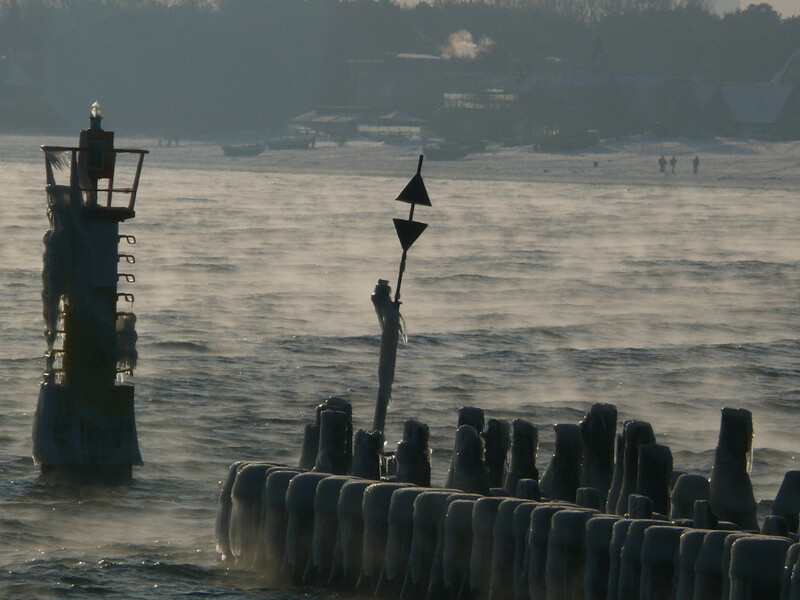 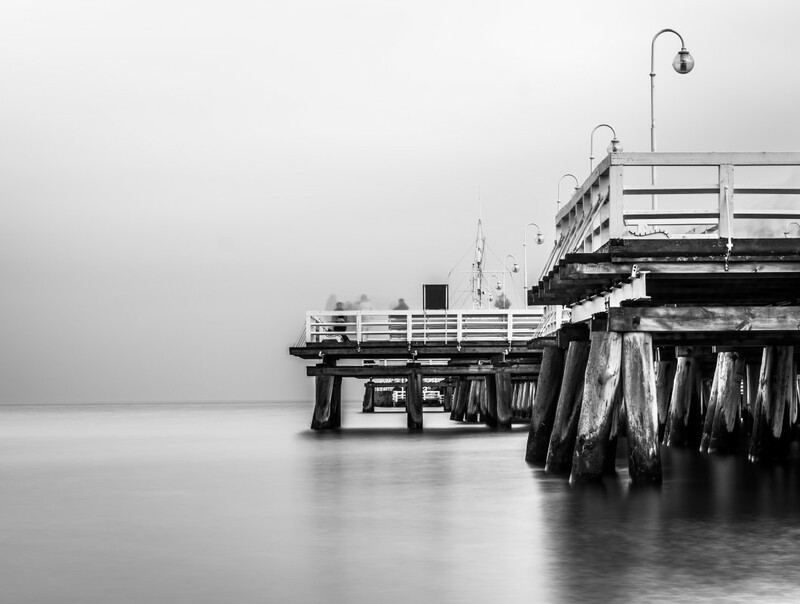 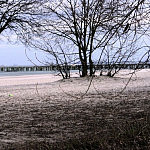 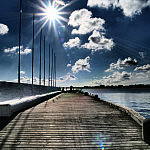 The first pier 41 m long was built by Dr. Jerzy Haffner in 1829. 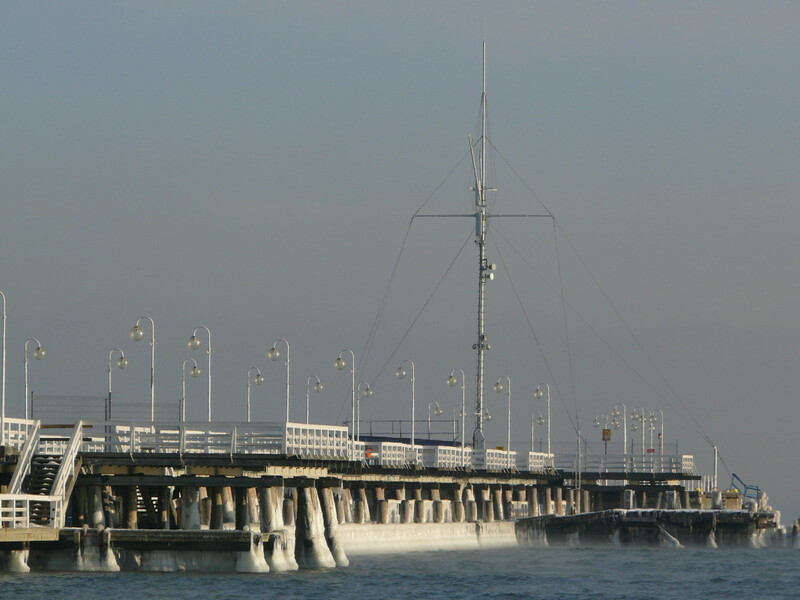 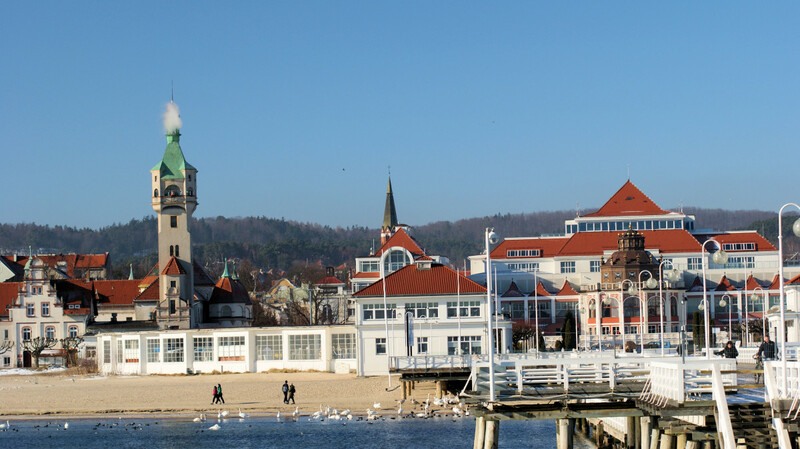 By the end of the 19th century, the pier had extended to 150 m and then up to 315 m by 1910. 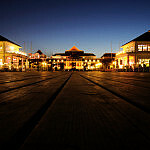 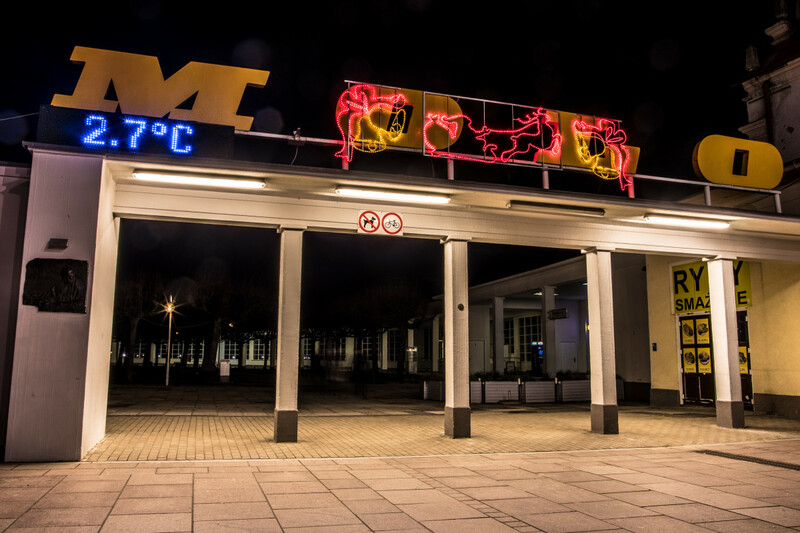 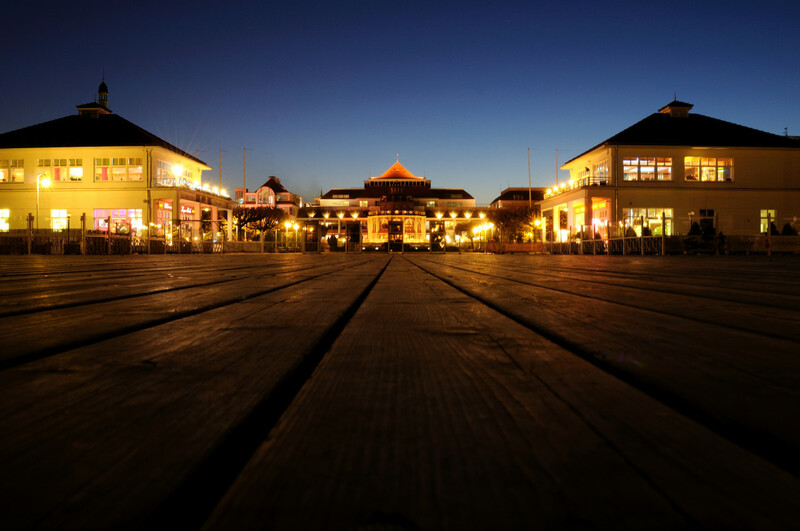 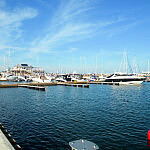 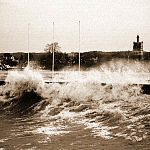 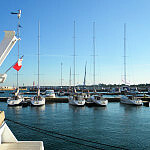 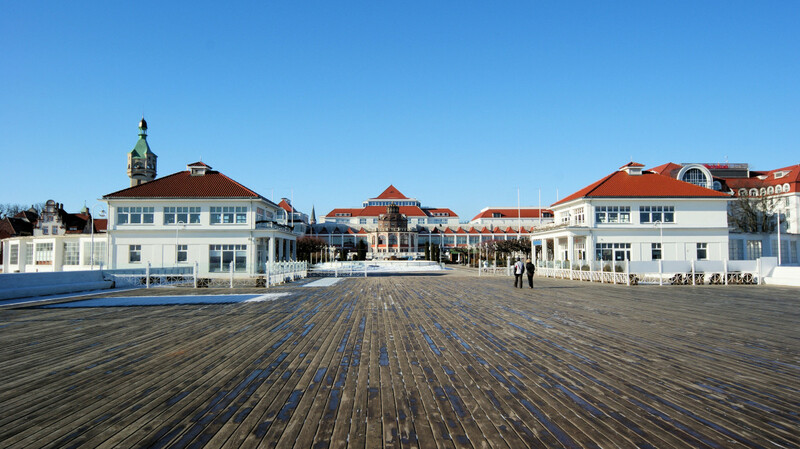 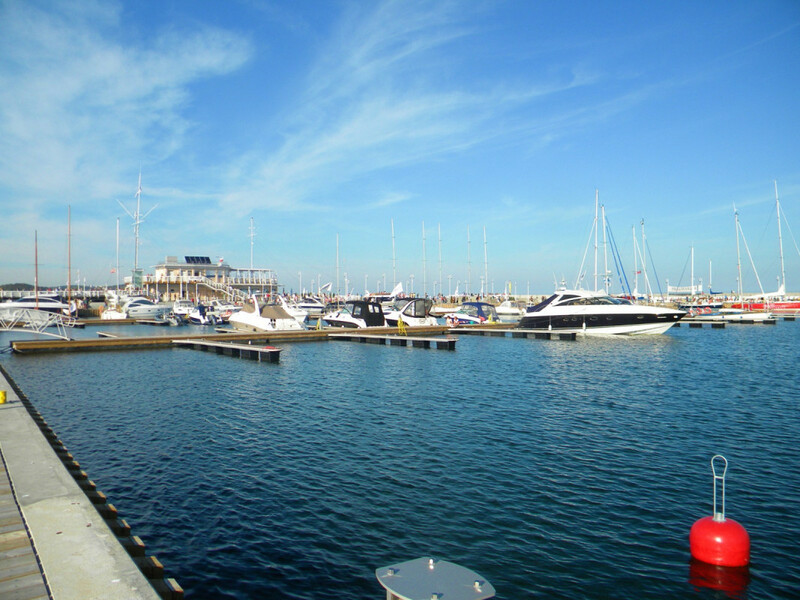 At first it was used as a local wharf and gradually transformed into a recreational spot and later on, after the fountain and concert stage were added, it became an entertainment venue. 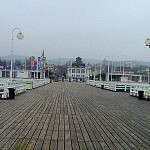 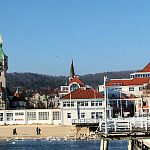 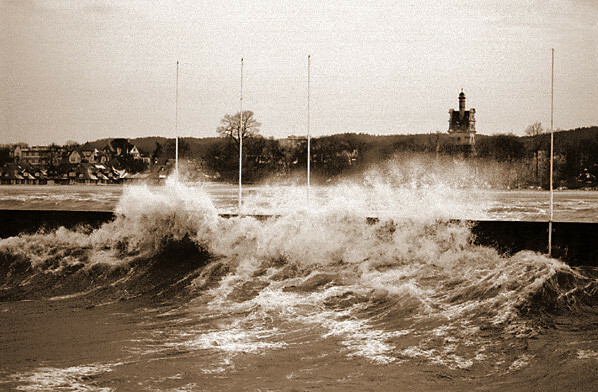 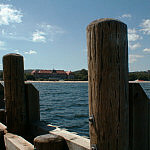 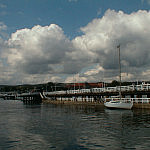 The present form of the pier took shape in 1927 as part of the town's 25 anniversary. 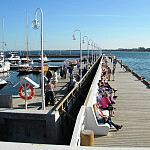 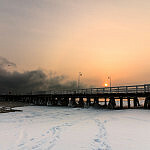 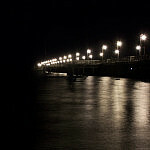 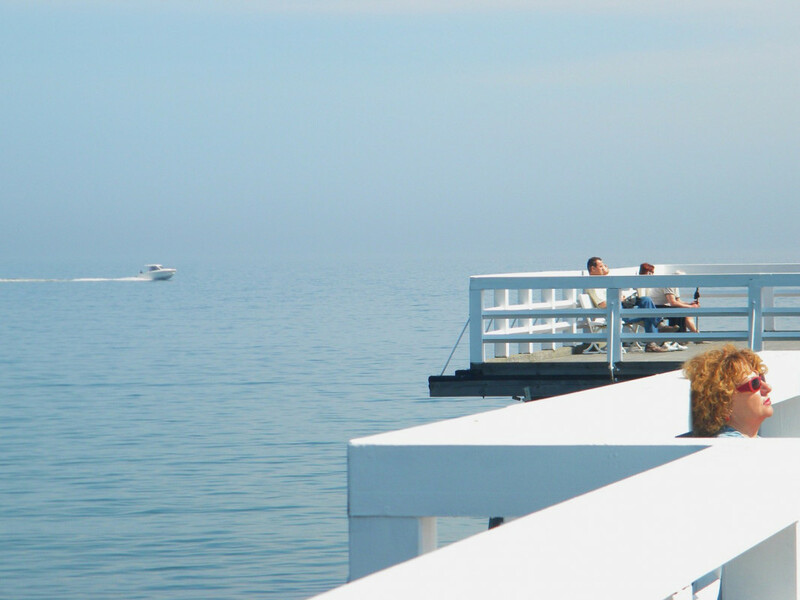 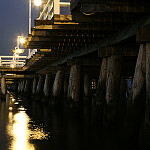 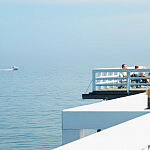 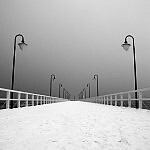 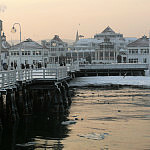 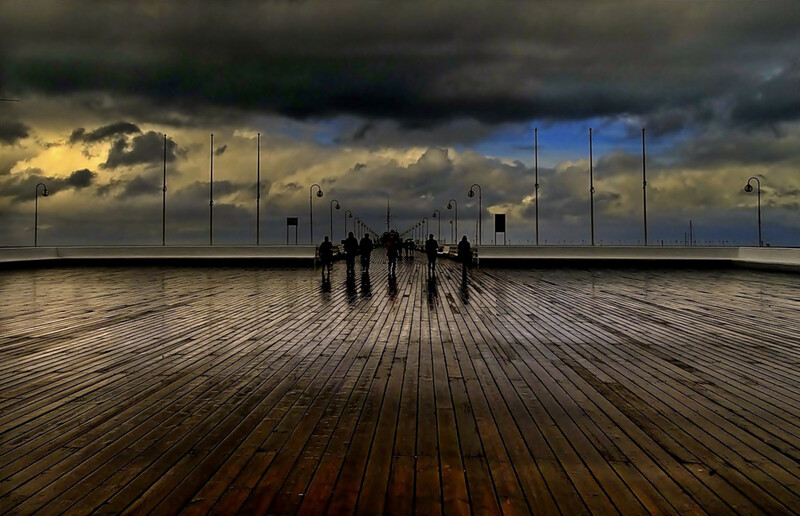 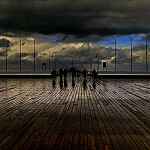 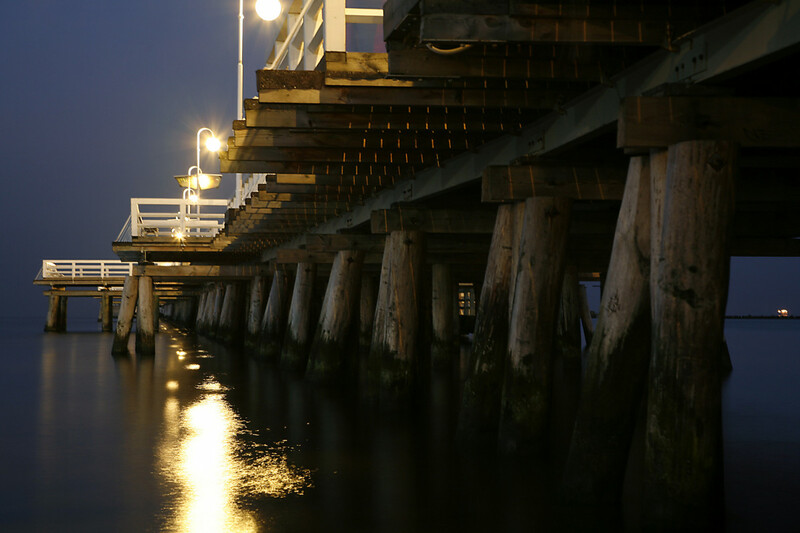 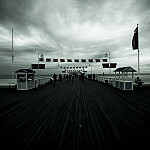 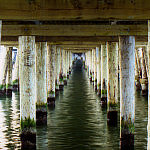 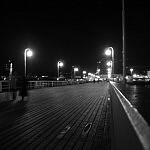 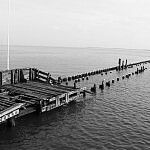 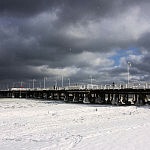 Since that time the pier has remained largely unchanged in spite of numerous renovations. 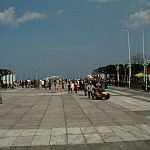 The most recent work took place between 1989-91 as well as 1999-2000 and 2002-3. 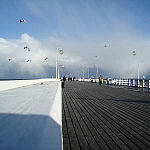 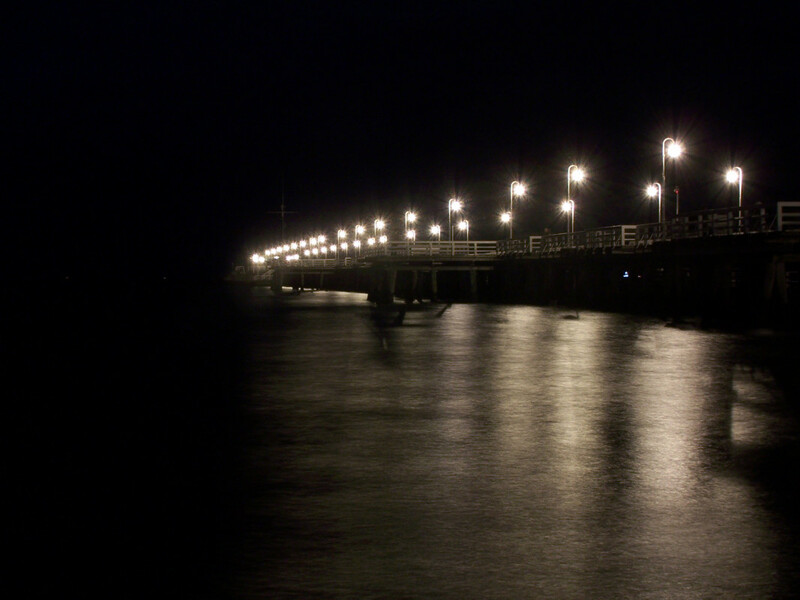 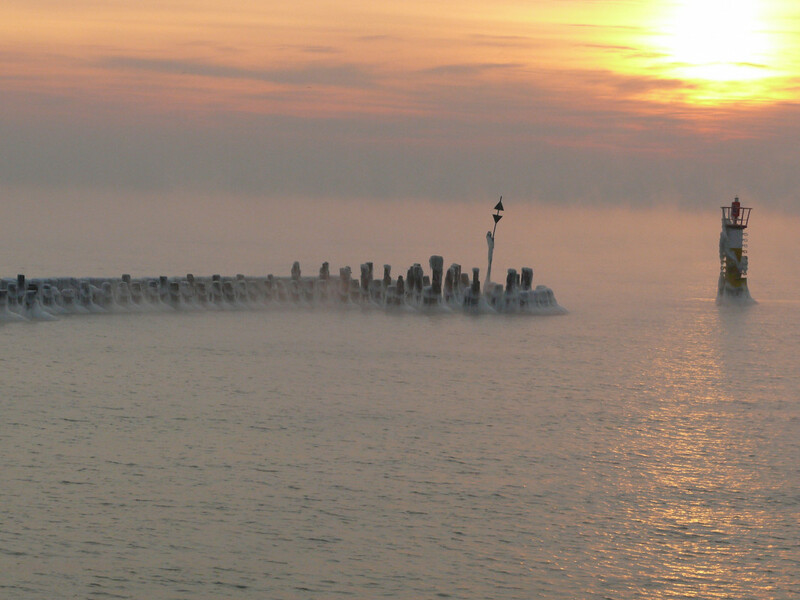 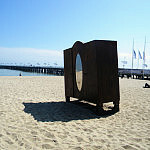 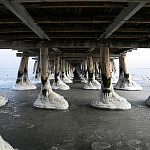 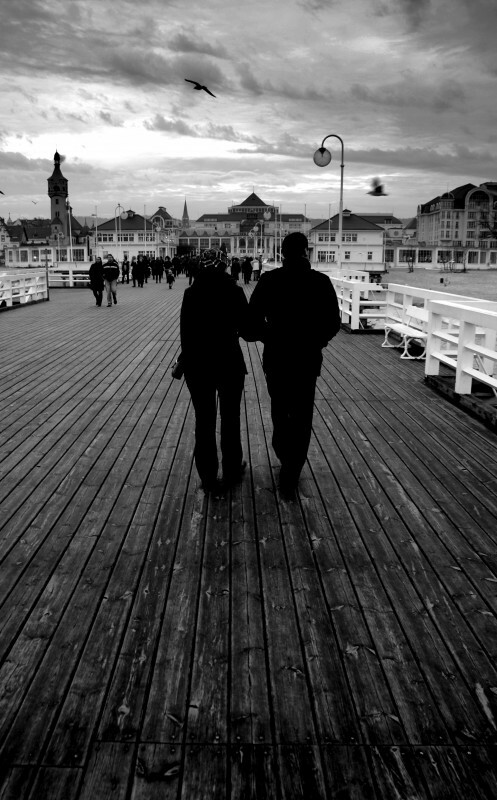 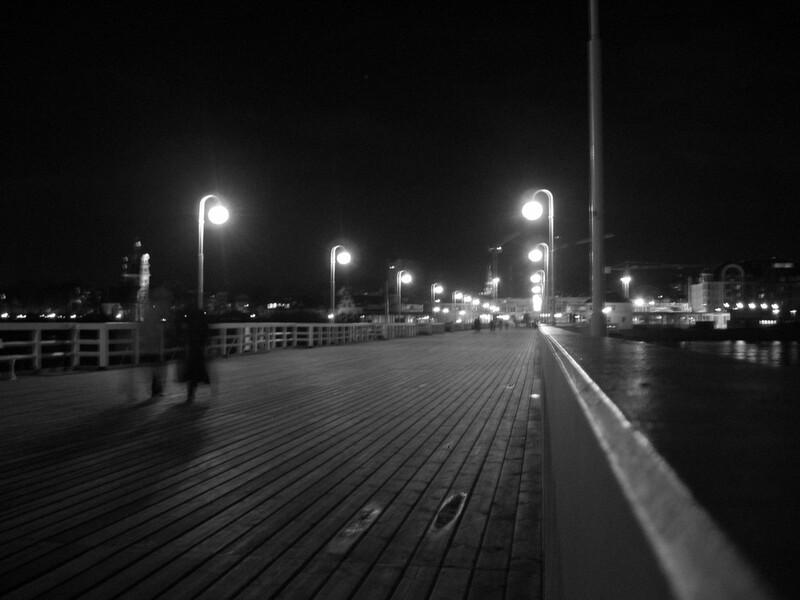 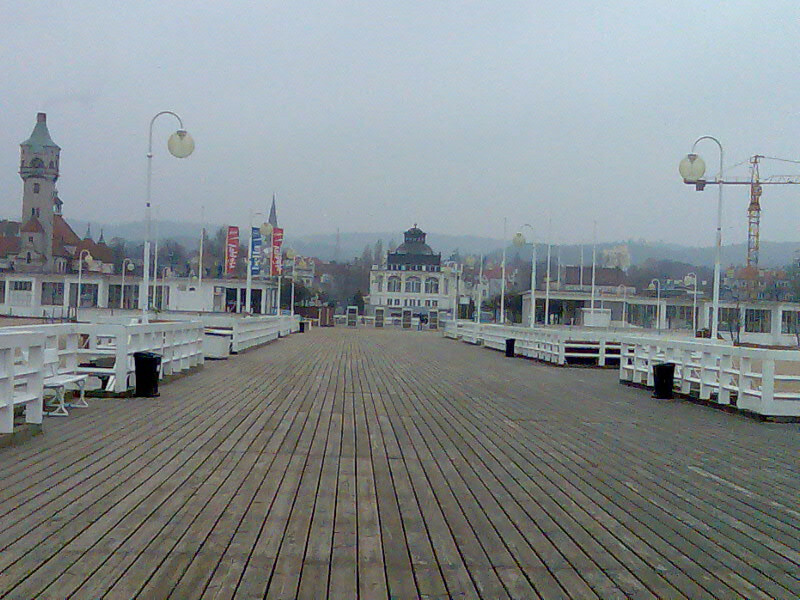 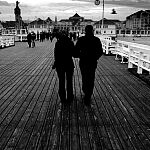 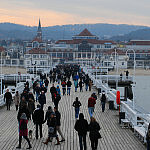 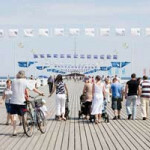 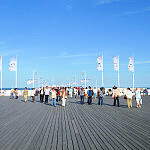 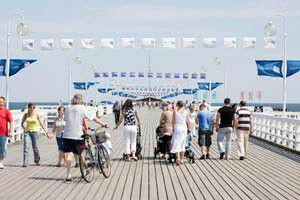 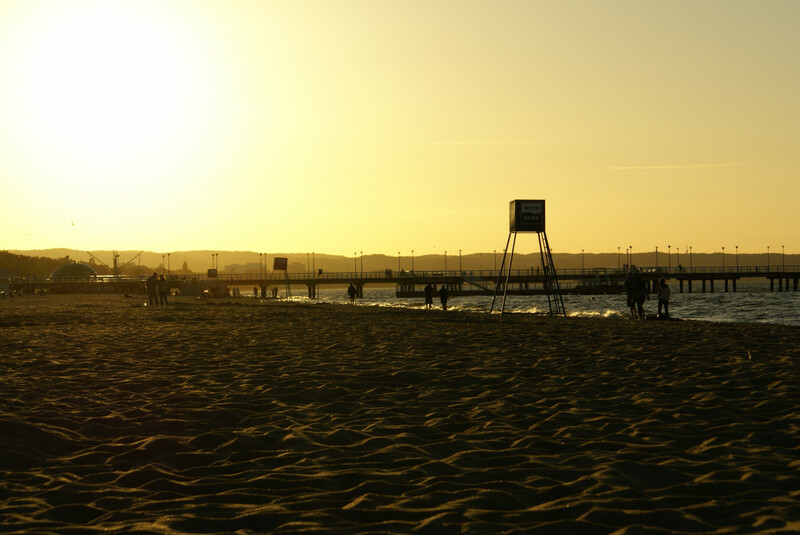 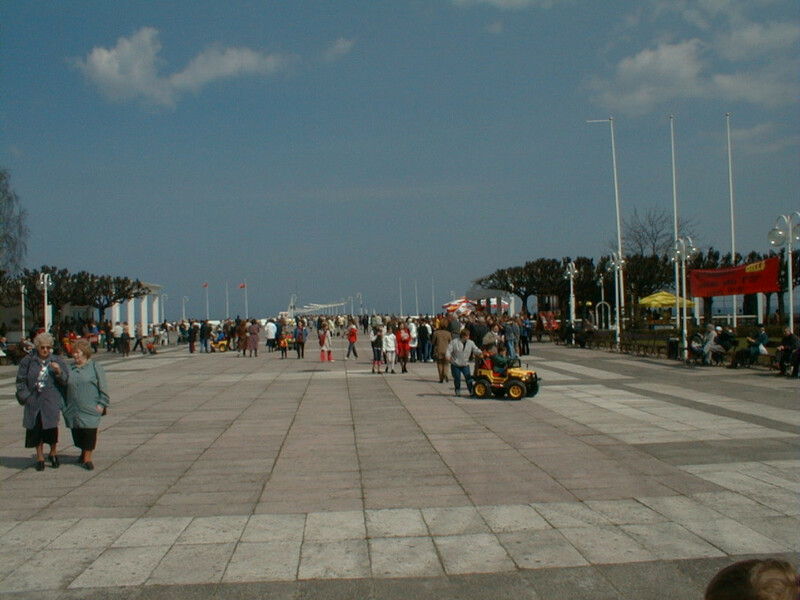 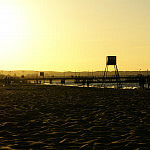 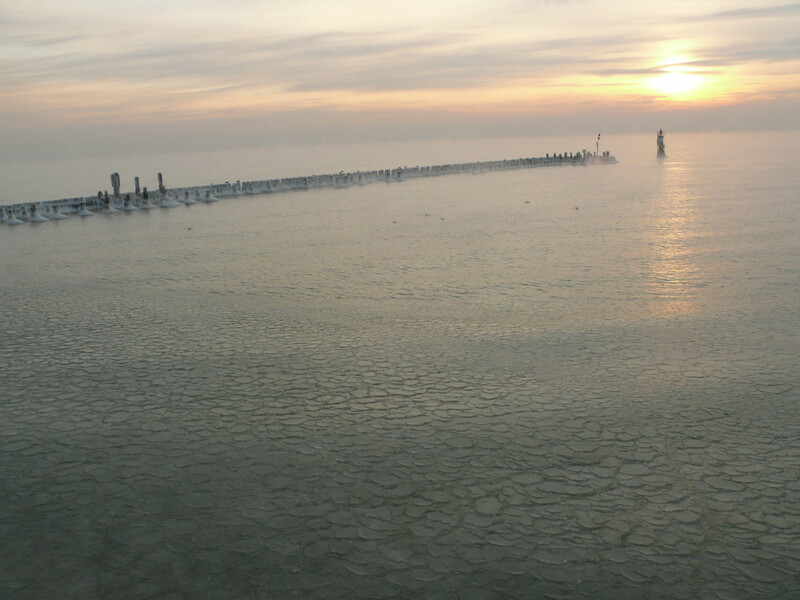 At the end of 2005 the part of the Pier bordering the beach was renovated. 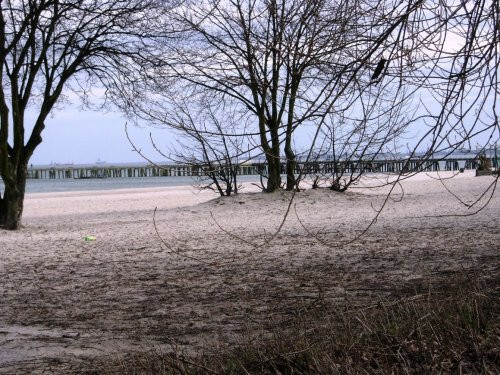 Na tym się skończyło, nie przyszło mi do głowy , że za coś takiego pobiera się pieniądze, mieliśmy zamiar odwiedzić Sopot z Dziewczyną wieczorem, ale naprawdę wolę Gdańsk. 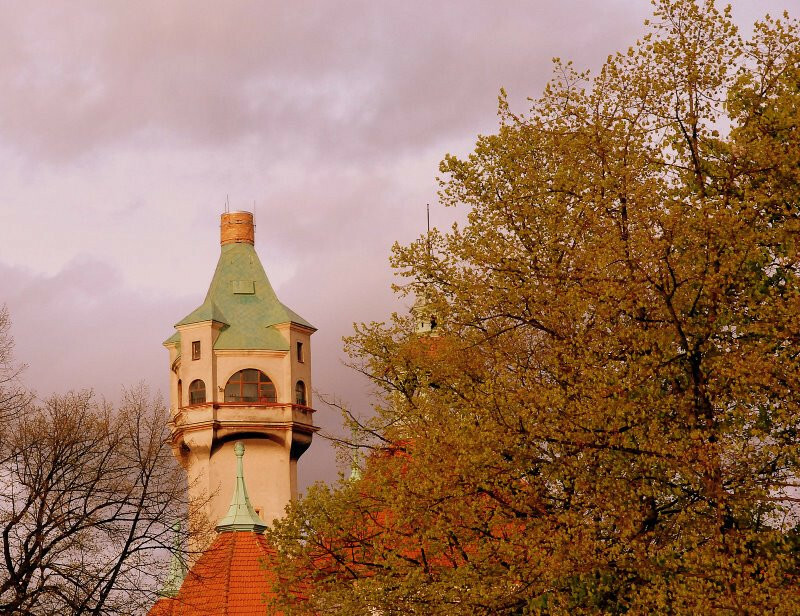 Kolejka do kas później kolejka do bramki gdzie jakaś kobita krzyczy na dziecko że ma czekać na swoją kolej do podejścia pod kołowrotek. 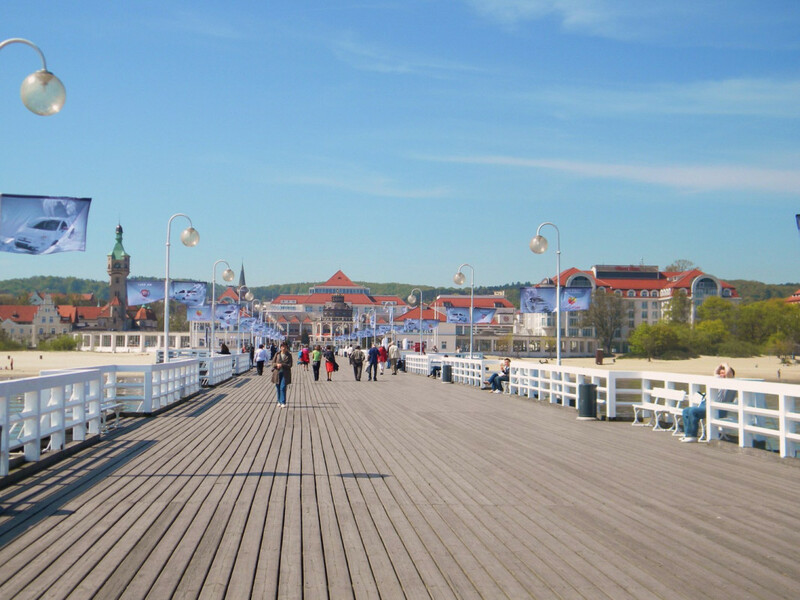 Ciekawiej i taniej było na Helu wczoraj. 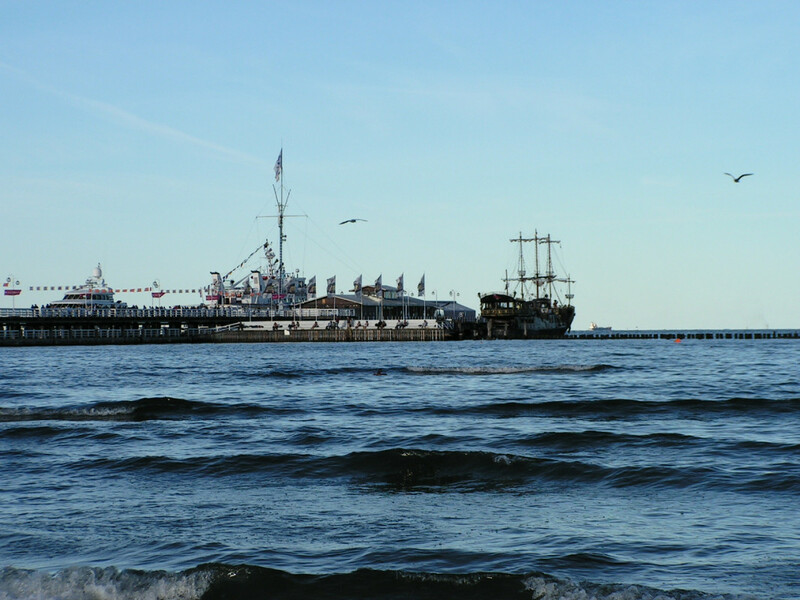 czy molo powinno byc platne to juz kwestia dyskusyjna, bo przyznam ze malo gdzie mozna spotkac platne molo. 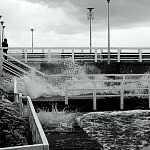 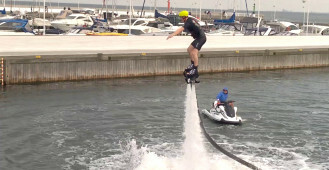 ale co mnie najbardziej zirytowalo to platna toaleta na platnym molo!!! 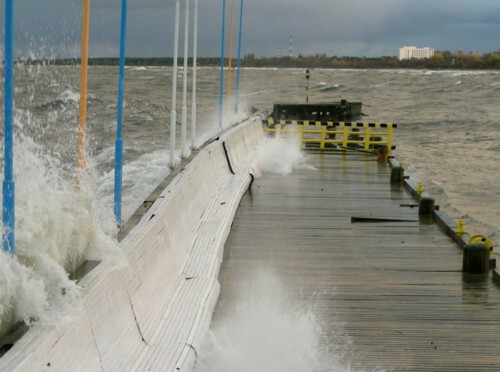 to juz uwazam za zdzierstwo. 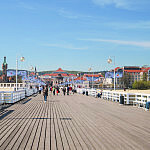 Wchodzac z dwojka dzieci zaplacilismy 19zl + wejscie dziecka do toalety 6zl (bo wiadomo ze 4 latek sam do toalety nie wejdzie wiec wchodzi z nim rodzic czyli policzyli nam2x3zl). 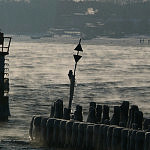 Do tego u pani na drzwiach duzymi literami napisane ze maja licznik osob. 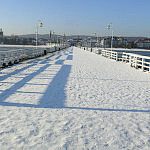 to pozostawia jakis dziwny niesmak. 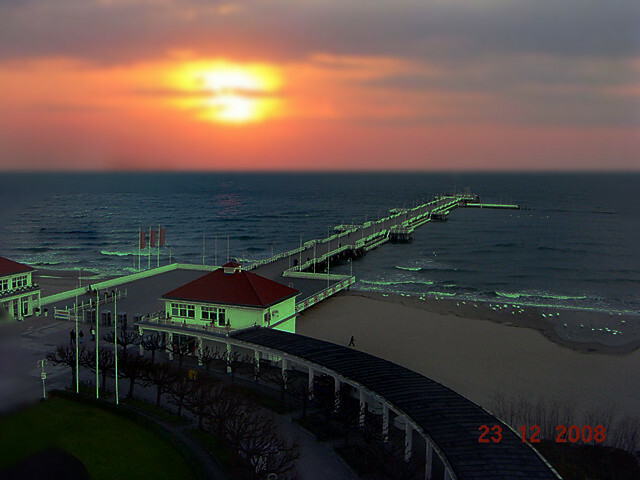 Ja mialam wrazenie ze w Sopocie zarabia sie glownie na toaletach zamiast skupic sie faktycznie na jakosci uslug.